Eduardo Gallo-Cajiao, from UQ’s School of Biological Sciences and the School of Earth and Environmental Sciences, said conserving these birds was a huge challenge, but efforts were well under way. 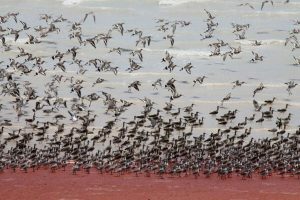 “Every year, millions of shorebirds travel between their breeding grounds in the northern hemisphere, primarily in Russia and Alaska, and their wintering areas in the southern hemisphere, including Australia and New Zealand,” he said. The research revealed the number of active agreements, who participates in them, and the threats they address. 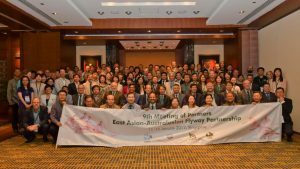 “A total of 28 agreements make up the international framework for conserving migratory shorebirds in the Flyway, with 57 government and non-government participants,” Mr Gallo-Cajiao said. The team discovered that Flyway-relevant agreements are not exclusive to national governments, with NGOs and local governments becoming key players. “NGOs have been emerging as signatories to some of these agreements since the mid-2000s, and local governments, such as Seocheon County in the Republic of Korea, have been entering into additional agreements,” Mr Gallo-Cajiao said. “The rise in the number of agreements seems to be the result of governance demand in critical areas around the Yellow Sea, where conservation priorities are high. The research has been published in Regional Environmental Change (DOI: 10.1007/s10113-019-01461-3). Media: Eduardo Gallo-Cajiao, e.gallocajiao@uq.edu.au, +1 425 393 7595, Skype: e.gallocajiao@gmail.com; Dominic Jarvis, dominic.jarvis@uq.edu.au, +61 413 334 924. 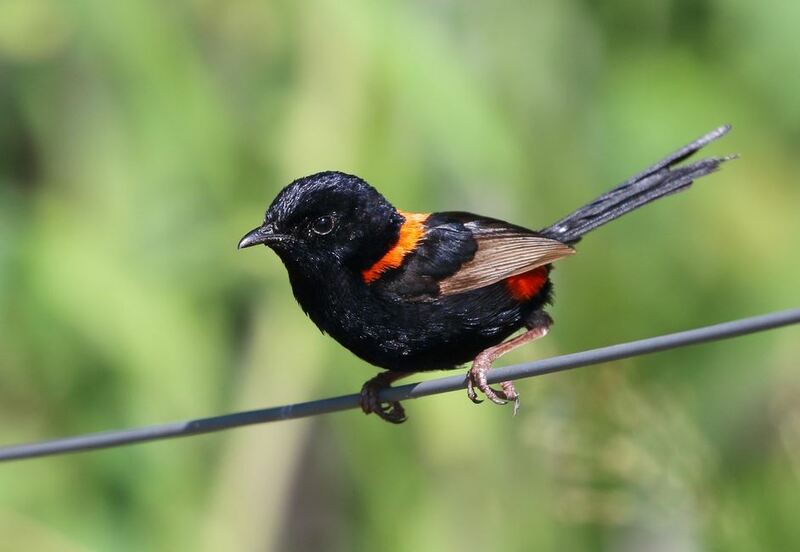 Birding Brisbane is a monthly newsletter about birds and birdwatching in the River City – download your copy today! Issues will uploaded to this page each month. Please email Richard Fuller with comments, story ideas, permission for us to use your eBird photos in future editions, or even better – draft material for the next issue! Happy reading, and have a happy time Birding Brisbane in 2019. 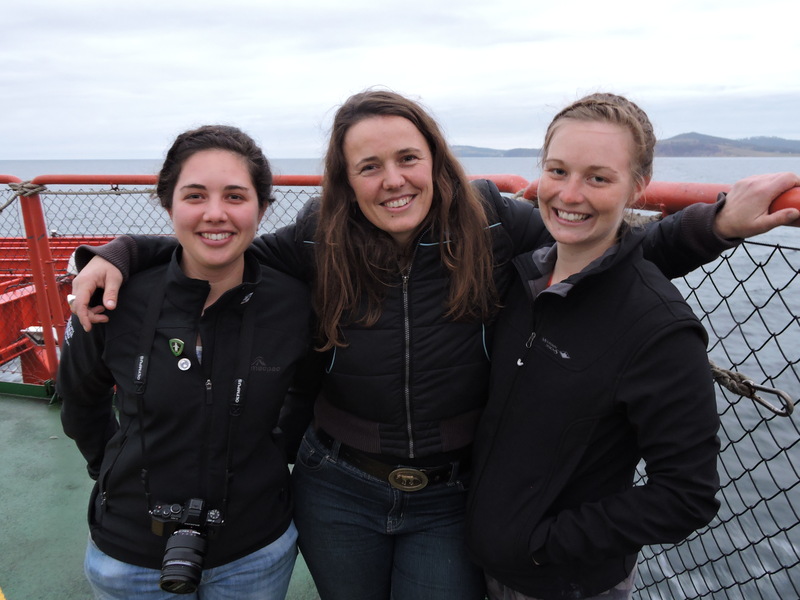 In October 2018, a Fuller Lab team made up of Rich, post-doc Brad Woodworth, PhD student Micha Jackson and masters student Mint Ren headed to Hobart to attend the 2018 Australasian Shorebird Conference. This biannual event is a key knowledge exchange and networking opportunity for the hard-working shorebird researchers and conservationists of the East Asian-Australasian Flyway (EAAF). Rich kicked off the conference with a keynote address, where he reflected on the groundbreaking 7th Australasian Shorebird Conference, also held in Hobart in 2009, a meeting where the shorebird community solidified concerns about suspected shorebird population declines. Nearly a decade later, our worst fears have been realised for a number of species that have exhibited precipitous declines. 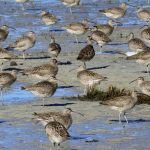 But unprecedented action has also been taken in response to clear evidence that habitat loss in the Yellow Sea is a key driver of the shorebird crisis. The profile of shorebirds and the rapid disappearance of many intertidal refuelling stations along their migration route has been raised enormously, and the international community galvanised. 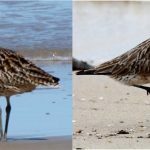 In 2018 alone, China has announced sweeping new policies to curb intertidal reclamation, China and the Republic of Korea have begun the World Heritage listing process for remaining Yellow Sea intertidal flats, and the Democratic People’s Republic of Korea has joined the East Asian-Australasian Flyway Partnership. But our work is far from done. Rich highlighted the urgent need to better understand the threat that hunting poses to our region’s shorebirds; the imperative to integrate artificial habitat management into shorebird conservation; the breakthrough in global intertidal habitat mapping that will allow us to understand the dynamics of these critical habitats like never before; and the importance of improving the accessibility of monitoring data to maintain current population estimates and trends. 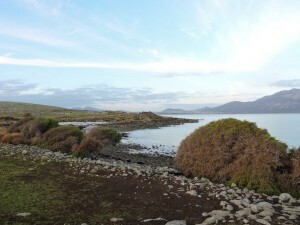 Later in the conference, Micha presented her research on shorebirds’ use of artificial habitats throughout the EAAF, which is highlighting the critical importance of managing working coastal wetlands (such as aquaculture, salt production and port sites) in conjunction with maintaining intertidal habitat, particularly in heavily developed regions. And last but not least, Brad presented the very last talk of the conference – his work on shorebird trends in the Great Sandy Strait region of Queensland, which highlights the importance of understanding local change and drivers to support effective management. 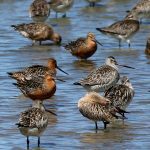 The conference also provided wonderful networking and birding events, such as the Bruny Island Bird Festival (where Micha caught up with all twelve of Tasmania’s endemic bird species), the launch of the stunning Overwintering Exhibition at the lovely Moonah Arts Centre, and local viewing of the mega rarity: Hudsonian Godwit! Many thanks go to the organisers and we look forward to finding out where the 2020 conference will bring us together again! 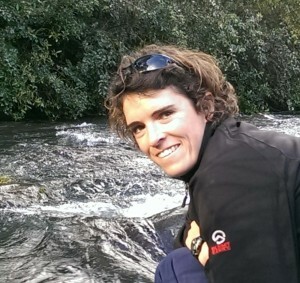 Micha’s attendance at the conference was generously supported by a Stuart Leslie Conference Award/BirdLife Australia. Rich presenting the keynote at the 2018 Australasian Shorebird Conference in Hobart. 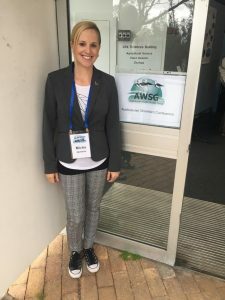 Micha at the entrance to the 2018 ASC at the University of Tasmania. 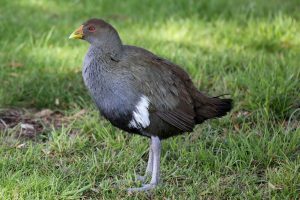 Tasmanian Native-hen, one of twelve endemic bird species in Tasmania. A University of Queensland-led international study published today in the prestigious journal Science shows that one-third of the land within Earth’s terrestrial protected area estate has been severely modified by human activities. Lead author Kendall Jones said that the degree of human activity within protected areas compromises their ability to conserve biodiversity and stop extinctions. “Over 90% of protected areas, such as national parks and nature reserves, showed some signs of damaging human activities” he said. Jones said the scale of the damage was striking. “While some human activities inside protected areas are expected, we found major road infrastructure such as highways, industrial agriculture, and even entire cities occurring inside the boundaries of places that are supposed to be set aside for nature conservation”. The authors used the updated global Human Footprint to analyse human activity across almost 50,000 protected areas worldwide. Senior author, Professor James Watson of UQ and the Wildlife Conservation Society, said the study is a stunning reality check when it comes to progress made by international community in averting the biodiversity crisis. “This study clearly shows we are overestimating the space available for nature inside protected areas. Governments are claiming these places are protected for the sake of nature when in reality they aren’t. It is a major reason why biodiversity is still in catastrophic decline, despite more and more land being protected” he said. 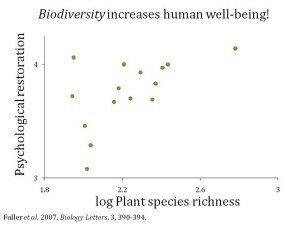 Despite the negative findings, Professor Watson emphasized the critical importance of protected areas for safeguarding imperiled biodiversity. “We know protected areas work – when well-funded, well-managed and well placed, they are extremely effective in halting the threats that cause biodiversity loss and ensure species return from the brink of extinction. There are also many protected areas that are still in good condition and protect the last strongholds of endangered species worldwide. The challenge is to improve the management of those protected areas that are most valuable for nature conservation to ensure they safeguard it”. The authors said that by highlighting protected areas in danger, the study can stimulate action to save them. “We also need all nations to be honest when accounting for how much land they have set aside for biodiversity conservation. It is time for the global conservation community to stand up and hold governments to account so that they take the conservation of their protected areas seriously” Kendall Jones said. Des travaux de recherche internationaux, publiés aujourd’hui dans le très prestigieux journal scientifique “Science” et menés par des chercheurs de l’Université du Queensland en Australie, montre qu’un tiers des espaces naturels protégés dans le monde ont été très gravement dégradés par l’homme. L’auteur principal de l’étude Kendall Jones, a déclaré que le degré d’activités humaines au sein d’aires naturelles protégées compromet leurs capacités à conserver la biodiversité et à empêcher l’extinction des espèces. « Plus de 90% des espaces naturels protégés, tels que les parcs nationaux et les réserves naturelles, montrent des signes de dommage liés aux activités humaines ». Mr Jones a déclaré que l’ampleur des dégâts était frappante. Pour cette étude, les chercheurs ont analysé le degré de pression humaine dans près de 50 000 espaces naturels protégés dans le monde. Les aires naturelles protégées les plus dégradées ont été trouvées en Asie, en Europe et en Afrique – les territoires aux populations humaines les plus denses. Il a également été découvert que de larges aires naturelles strictement protégées se trouvent sous moins de pression humaine que des aires naturelles de plus petites tailles. James Watson, Professeur à l’Université du Queensland et chercheur pour l’ONG international ‘Wildlife Conservation Society’, a déclaré que cette étude est un étourdissant retour à la réalité quant aux progrès réalisés par la communauté internationale pour éviter l’extinction des espèces. Malgré ces découvertes négatives, Professeur Watson souligne l’importance irréfutable des aires naturelles protégées pour la sauvegarde de la biodiversité. « Nous savons que les aires protégées marchent – lorsqu’elles sont bien financées, bien gérées et bien situées, elles sont extrêmement efficaces pour stopper les menaces qui pèsent sur la biodiversité et pour assurer le retour des espèces au bord de l’extinction. Il existe également de nombreuses aires protégées qui sont encore en bon état et protègent les derniers bastions d’espèces menacées dans le monde. Le défi consiste à améliorer la gestion des zones protégées les plus précieuses pour la conservation de la nature afin de garantir leur protection ». Les auteurs de cette étude espèrent qu’en mettant en évidence les zones protégées en danger, l’étude peut encourager la mise en place d’actions de protection de ces zones. « Nous avons également besoin que toutes les nations responsables d’espaces naturels protégés soient honnêtes en comptabilisant combien de territoires sont mis de côté pour la conservation de la biodiversité. Il est temps que la communauté mondiale oblige les gouvernements à rendre des comptes afin qu’ils prennent au sérieux la conservation de leurs aires protégées », a déclaré Kendall Jones. Cette étude internationale de l’Université du Queensland, de la Wildlife Conservation Society et de l’Université du Nord de la Colombie-Britannique est publiée dans la revue ‘Science’. Un estudio internacional dirigido por la Universidad de Queensland y publicado hoy en la prestigiosa revista Science muestra que un tercio del área dentro de las áreas terrestres protegidas ha sido severamente modificada por actividades humanas. El autor principal Kendall Jones dijo que el grado de actividad humana dentro de las áreas protegidas compromete su capacidad para conservar la biodiversidad y detener las extinciones. “Más del 90% de las áreas protegidas, como parques nacionales y reservas naturales, mostraron alguna señal de actividad humana dañina”, dijo. El Sr. Jones dijo que la escala del daño fue sorprendente. “Si bien se esperan algunas actividades humanas dentro de las áreas protegidas, encontramos importante infraestructura vial como autopistas, también agricultura industrial e incluso ciudades enteras que se ubican dentro de los límites de lugares que se supone están destinados a la conservación de la naturaleza”. Los autores utilizaron la huella humana global actualizada, (The global Human Footprint; https://www.nature.com/articles/ncomms12558) para analizar la actividad humana en casi 50,000 áreas protegidas de todo el mundo. Las áreas protegidas más impactadas se encontraron en Asia, Europa y África, lugares con población humana masiva. También descubrieron que las áreas protegidas más estrictas y las más grandes se encuentran bajo mucha menos presión humana que las áreas protegidas más pequeñas y las que permiten rangos más amplios de actividades humanas. 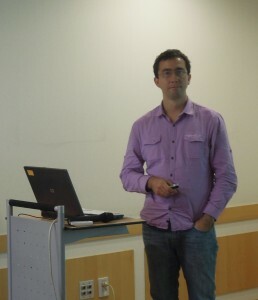 El profesor James Watson de la universidad de Queensland y la Sociedad de la Conservación de la Vida Silvestre, WCS por sus siglas en inglés, es otro de los autores del artículo. Él dijo que el estudio es una impactante mirada de la realidad en lo que respecta al progreso realizado por la comunidad internacional para evitar la crisis de la biodiversidad. De igual forma declaro que “Este estudio muestra claramente que estamos sobreestimando el espacio disponible para la naturaleza dentro de las áreas protegidas. Los gobiernos afirman que estos lugares están protegidos por el bien de la naturaleza cuando en realidad no lo están. Es una de las principales razones por las que la biodiversidad aún está en un declive catastrófico, a pesar de que cada vez se protegen más tierras”. A pesar de los resultados negativos, el Profesor Watson hizo hincapié en la gran importancia de las áreas protegidas para salvaguardar la biodiversidad en peligro. “Sabemos que las áreas protegidas funcionan: cuando están bien financiadas, bien administradas y bien ubicadas, son extremadamente efectivas para detener las amenazas que causan la pérdida de biodiversidad y para garantizar que las especies regresen del borde de la extinción. También hay muchas áreas protegidas que todavía están en buenas condiciones y protegen los últimos refugios de especies en peligro de extinción en todo el mundo. El desafío es mejorar la gestión de las áreas protegidas más valiosas para la conservación de la naturaleza para garantizar su protección”. Los autores dijeron que al determinar las áreas protegidas en peligro, el estudio puede estimular las acciones para salvarlas. “También necesitamos que todas las naciones sean honestas al contabilizar la cantidad de tierra que han reservado para la conservación de la biodiversidad. Es hora de que la comunidad conservacionista mundial se levante y haga que los gobiernos tomen en serio la conservación de sus áreas protegidas y rindan cuentas de la protección real dentro de las mismas “, dijo Kendall Jones. Did you know that tomorrow is World Curlew Day – a global celebration of a remarkable group of birds – the curlews! April 21 was chosen for World Curlew Day because of a traditional Welsh tale that identifies St Beuno as the first curlew conservationist. The story goes that St Beuno was sailing and dropped his prayer book into the ocean; when a curlew picked up the book and took it to the shore to dry, St Beuno decreed that it should be specially protected. But hang on, what is a curlew exactly?! The curlews, or more precisely the Numeniini, are a group of 13 shorebird species most well known for their amazingly long bills. Some curve up and some curve down, but all are incredibly well adapted to probing for food in the soft mud of the world’s shorelines. Some people have even associated sinister motives to these incredible appendages, as in The Night of the Curlews, a short story by Colombian author Gabriel Garcia Marquez in which three men have their eyes pecked out by curlews and are left to wander in confusion when nobody believes their story. Numeniini occur on all continents except Antarctica. 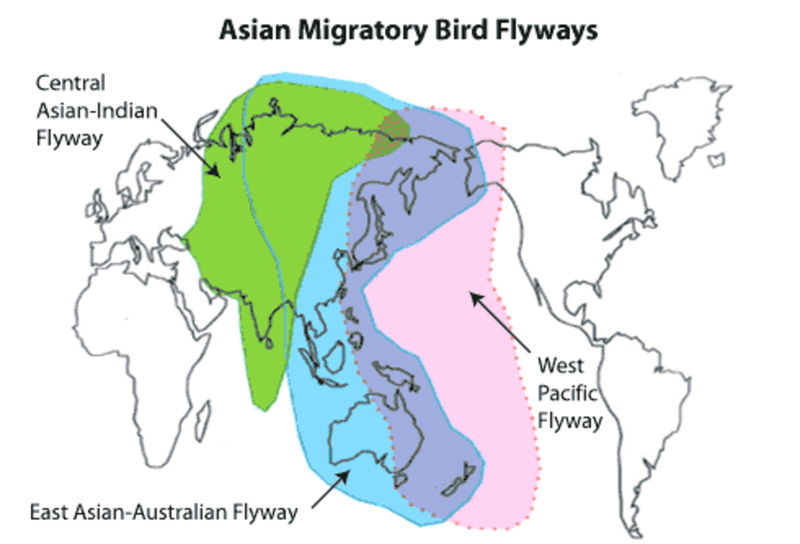 Most of them are long-distance migrants and make huge journeys every year between breeding areas in the boreal/arctic and non-breeding areas in the southern hemisphere. A full list of Numeniini and their whimsical names is as follows: Upland Sandpiper, Bristle-thighed Curlew, Whimbrel, Little Curlew, Eskimo Curlew, Slender-billed Curlew, Long-billed Curlew, Eurasian Curlew, Far Eastern Curlew, Bar-tailed Godwit, Black-tailed Godwit, Marbled Godwit, and, Hudsonian Godwit. 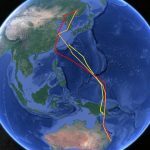 One curlew species, the Bar-tailed Godwit, holds the record for the longest single flight ever recorded by any bird – a non-stop 9 day flight of 11,700 km! 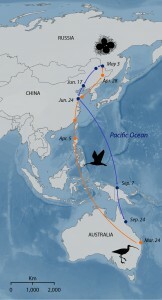 This unbelievable trip took place from breeding grounds in Alaska to non-breeding grounds in New Zealand over the vast expanse of the Pacific Ocean and is known because the bird had been fitted with a satellite transmitter. 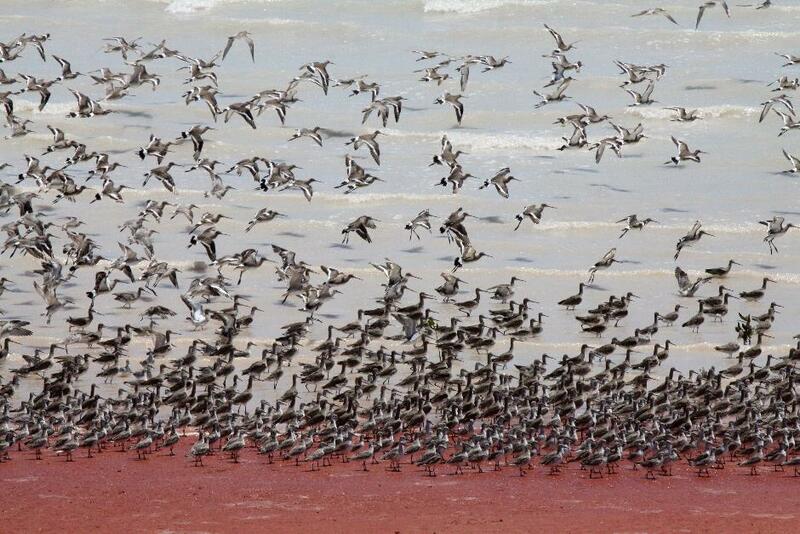 A group of beautiful Bar-tailed Godwits getting ready to migrate from Australia to their arctic breeding grounds. Photo: Micha V Jackson. Last year, scientists consulted a large group of experts to review the status of the world’s curlews. Unfortunately, seven of the world’s 13 curlew species are of conservation concern, and some are in very serious trouble due to widespread threats across their global ranges. 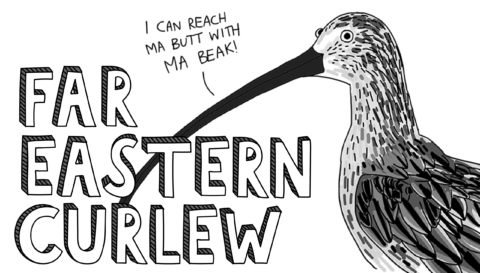 Some of the threats identified by this group of experts as having the biggest impacts on curlews include: habitat loss in non-breeding areas, disturbance, invasive species, pollution, and climate change…and most of these are getting worse. You can read the full paper here. Tragically, we have already lost at least one species of curlew – the once-abundant Eskimo Curlew. 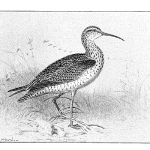 In his book North American Shorebirds from 1895, Daniel Giraud Elliot writes of the Eskimo Curlew: “In the Mississippi Valley this species is the most abundant of the Curlews, and in immense numbers scatters over the prairie in every direction…When feeding about in such large flocks, they keep up a constant low chattering noise, as if indulging in an uninterrupted flow of conversation.” But by the early 1900s this species had been effectively wiped out by unregulated hunting. The last time it was recorded with certainty was in 1963, and it is now considered extinct. Devastatingly, we may have lost another curlew species even more recently – the Slender-billed Curlew has not been seen for more than 20 years. Missing from our skies: The Eskimo Curlew – already considered extinct. 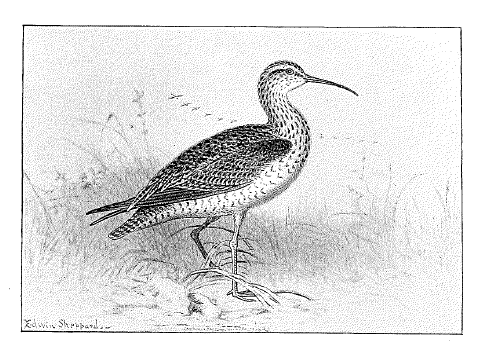 Drawing by Edwin Sheppard extracted from North American Shorebirds by Daniel Giraud Elliot © Francis P. Harper, 1895. 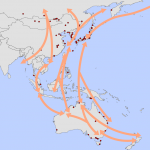 Migratory shorebirds that spend their non-breeding season in Australia follow a route known as the East Asian-Australasian Flyway to complete their annual migrations. One species, the Far Eastern Curlew, is endemic to this flyway, occurring nowhere else on earth. Unfortunately this is one of the curlew species that is declining rapidly and is listed as Critically Endangered by the Australia government. 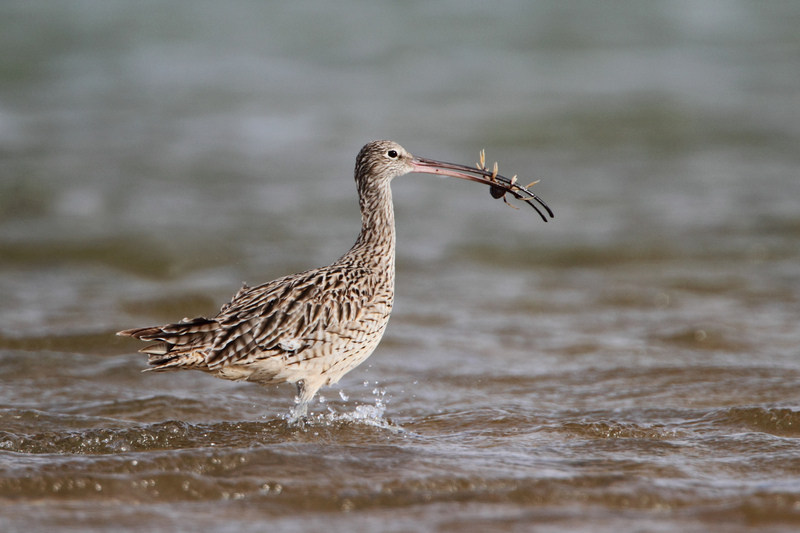 Far Eastern Curlew is one of several shorebirds in Australia that are heavily reliant on the Yellow Sea region as a place to stopover – that is to rest and refuel – during their long migrations. It seems that those shorebird species that are most reliant on the Yellow Sea for stopovers are also the ones that are declining most severely, likely due to a high concentration of threats and particularly severe loss of tidal habitat in this important region. 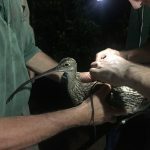 Curlews in trouble: Far Eastern Curlew, endemic to our region, listed globally as Endangered and nationally listed as Critically Endangered under the Australian EPBC Act; Bar-tailed Godwit, listed globally as Near Threatened and its subspecies menzbieri nationally listed as Critically Endangered. Photos: Micha V Jackson. Efforts to learn more and better protect curlews in our flyway are being undertaken by many researchers, conservationists and organisations. The Queensland Wader Study Group (QWSG) and the University of Queensland recently initiated a tracking study of Far Eastern Curlews in Moreton Bay to learn more about the non-breeding movements and habitat use of this species and build on a previous tracking study by QWSG to determine the precise migratory route(s) of this species through the East Asian-Australasian Flyway. 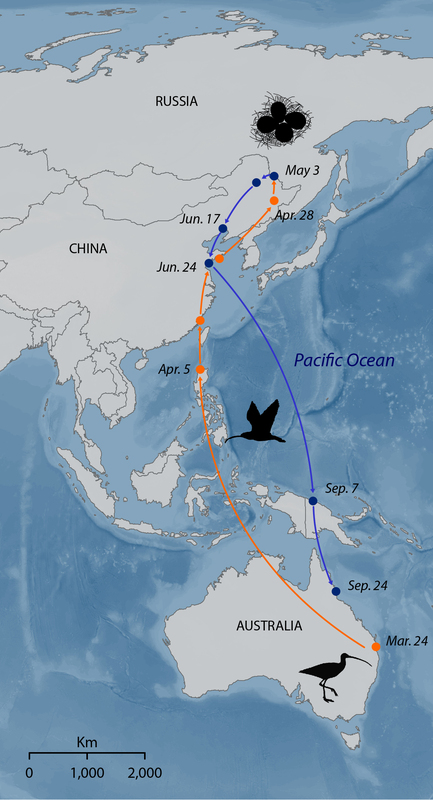 To date, the QWSG-led team has equipped four Far Eastern Curlew with backpack tracking devices, three of which are well on their way to the breeding grounds, having already travelled 6000+ kilometres to northeast China and Okinawa, Japan since early March 2018. The fourth curlew, like many other younger curlew, is expected to remain in the southern hemisphere for another year before making its first northward journey to the breeding grounds. Fuller Lab member Brad Woodworth is one of many researchers and volunteers contributing to this project. 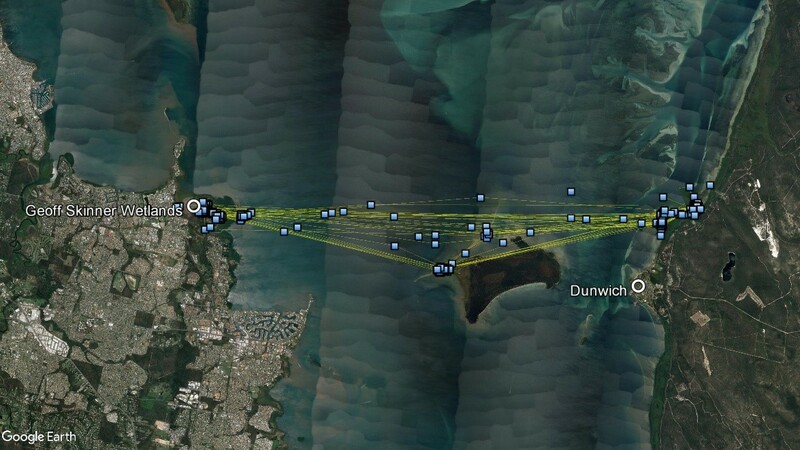 (top) Northward migration routes of three Far Eastern Curlew equipped with tracking devices in Moreton Bay as of 12-Apr-2018; (bottom) local movements of a single Far Eastern Curlew between Geoff Skinner Wetlands and Dunwich, North Stradbroke Is., a distance of ~16 km, over a two week period in early March. You can read more and stay up-to-date with these birds on the QWSG Whimbrel and Curlew tracking webpage. 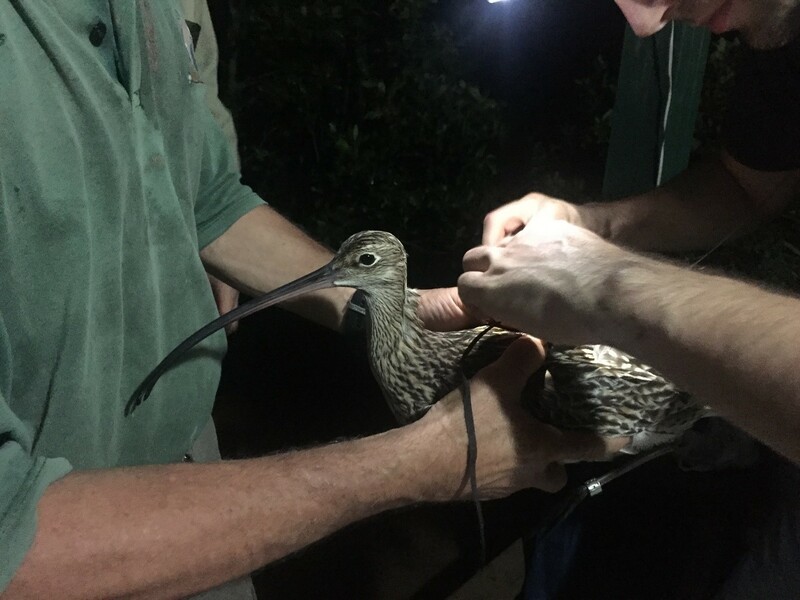 One of the Far Eastern Curlews recently fitted with a satellite transmitter in Moreton Bay, Qld. 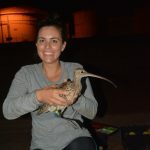 Another research project focused on protection of Far Eastern Curlews in Australia is the National Environmental Science Program’s Strategic planning for the Far Eastern Curlew led by shorebird researcher Amanda Lilleyman at Charles Darwin University. 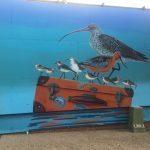 This project partners with local industry Darwin Port, where at an artificial site managed by the Port, the Far Eastern Curlew population has increased over the years. The site is used by the birds for roosting at high tide and Amanda has counted close to 300 Far Eastern Curlew at this site. 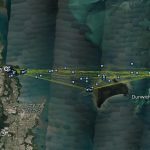 Amanda’s research involves catching birds and attaching satellite transmitters to them to track their movements around Darwin Harbour. So far she has found that the birds do not move far between their roosting and feeding habitats, and use only a few sites each day. 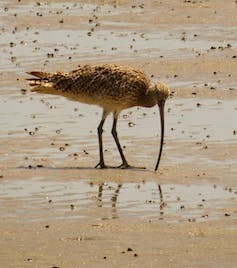 The Far Eastern Curlew also uses saltmarsh habitat, an ecological community that is considered endangered in some parts of the curlews’ non-breeding range. 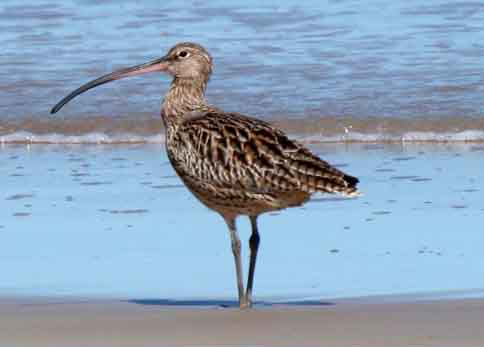 The Far Eastern Curlew faces many threats along the coastline of the non-breeding grounds and this project will provide important information on the ecological requirements of the species. 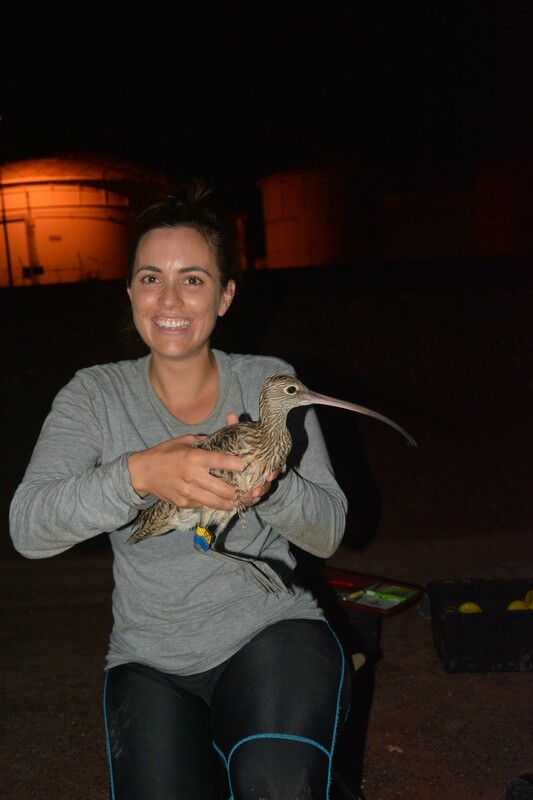 Darwin-based researcher Amanda Lilleyman holds a tagged Far Eastern Curlew. Shorebirds and their habitats are also the focus of Fuller Lab member Micha Jackson’s PhD research focused on conserving migratory birds in human-dominated landscapes. 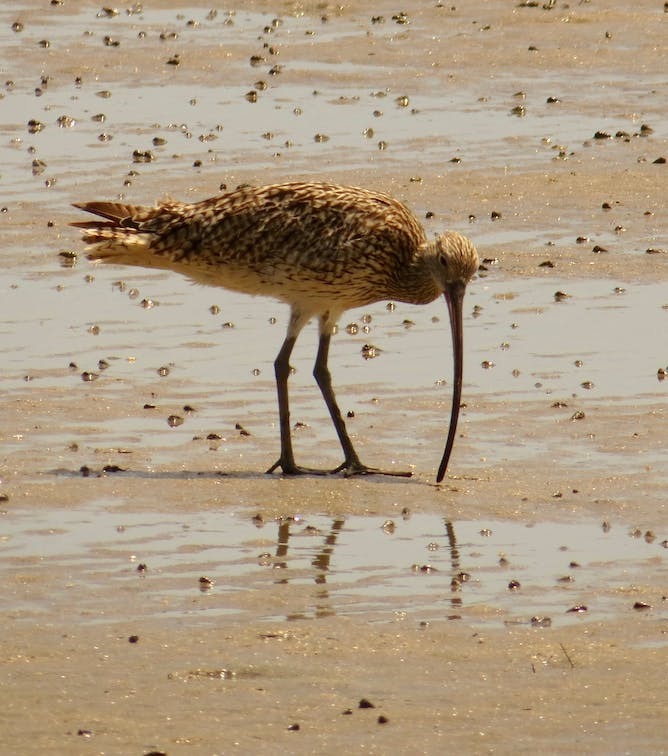 A key theme in Micha’s research is how migratory shorebirds, including Far Eastern Curlews, use artificial habitats as a result of the extensive changes that have occurred in coastal wetlands of the EAAF, and whether better management of these new environments could help them to recover. 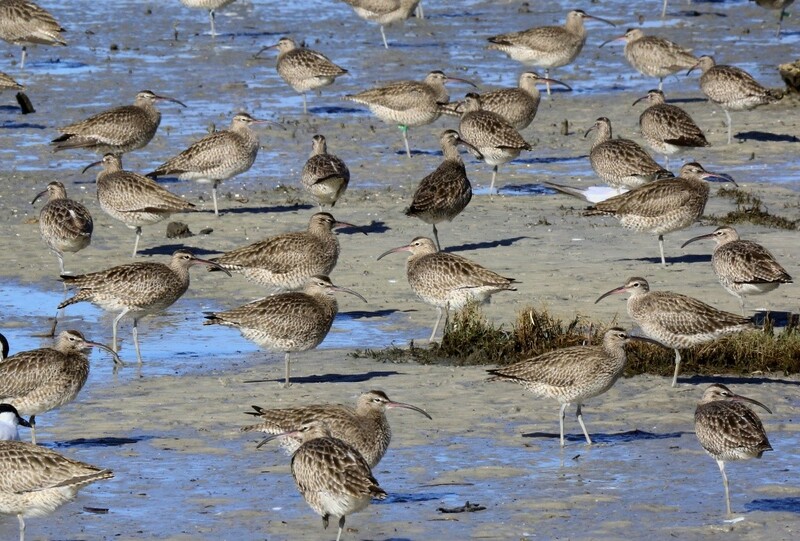 Whimbrels at an artificial roost in Queensland. Photo: Micha V Jackson. Because the migratory routes of shorebirds cross many country borders, international cooperation is an absolutely critical part of the effort to save the world’s curlews. 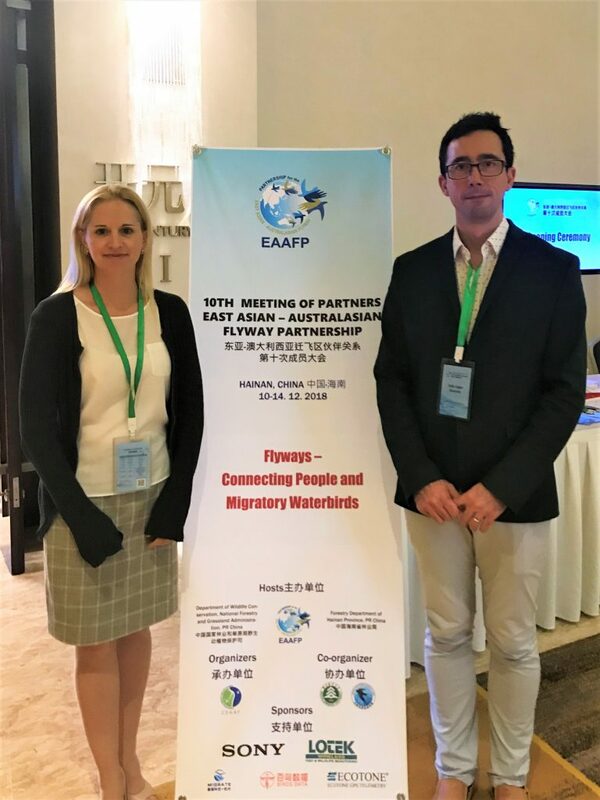 The East Asian-Australasian Flyway Partnership (EAAFP) is a multi-actor voluntary agreement for conserving migratory waterbirds along the 22 countries of the East Asian-Australasian Flyway. 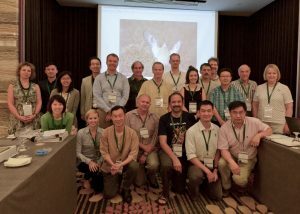 Representatives from the countries in the flyway meet regularly to enhance cooperation and discuss the most pressing threats to its shorebirds. 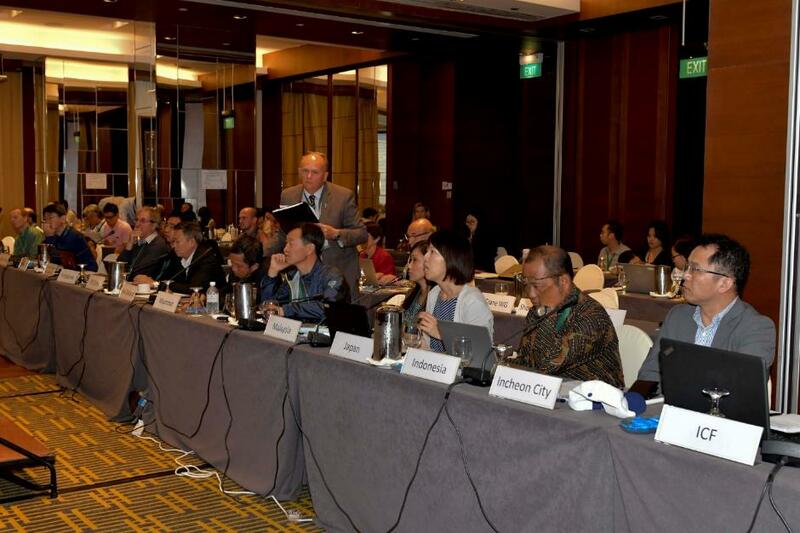 The last Meeting of Partners of the EAFFP took place in Singapore in 2017. 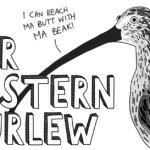 One of the initiatives approved at this meeting was an Action Plan for Far Eastern Curlew, which aims to coordinate research priorities and conservation action across the countries this species inhabits. 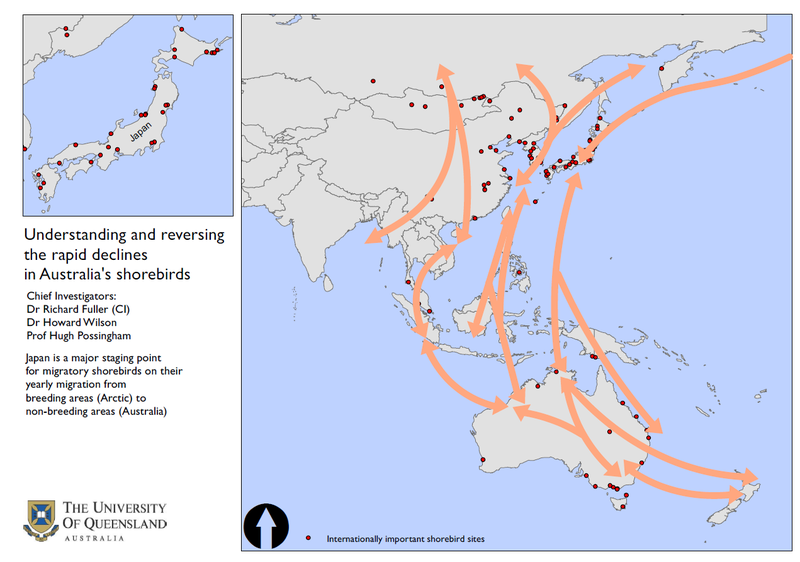 Fuller Lab member Ed Gallo-Cajiao’s PhD looks at the important issue of global governance for migratory species and how well international agreements work to protect shorebirds. Specifically, he studies the role of state and non-state actors, as well as the history of some of the agreements from this flyway. In addition to the EAAFP, 27 other conservation agreements exist in the flyway, including global agreements such as the Ramsar Convention on Wetlands and the Convention on Biological Diversity, as well as a suite of bilateral agreements for migratory bird conservation involving countries such as Japan, South Korea, Australia, China, Russia, and the US. Only time will tell if the dedicated efforts of people from around the world will ensure the survival of our remaining curlews! 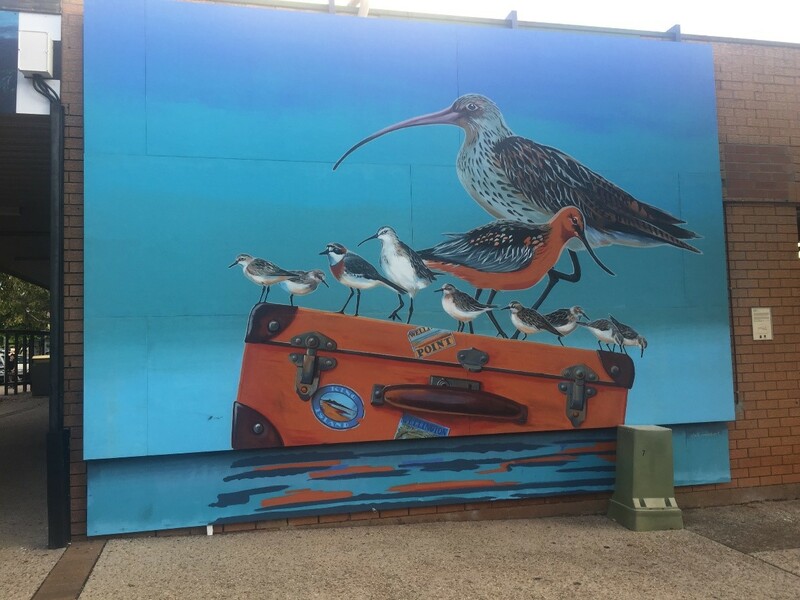 This beautiful mural was painted by Queensland-based artist Deb Mostert and is located at Wellington Point, Qld. It highlights the precarious position that migratory shorebirds, including curlews, find themselves in as a result of the myriad threats they now face on their annual migrations. 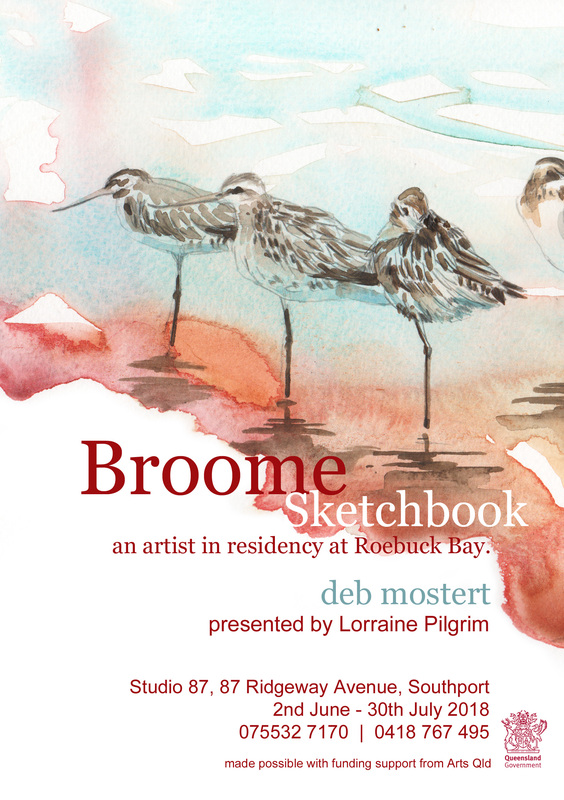 Deb will be showcasing some of her shorebird artwork at an upcoming exhibit, which will feature works from her recent time in Broome, WA. 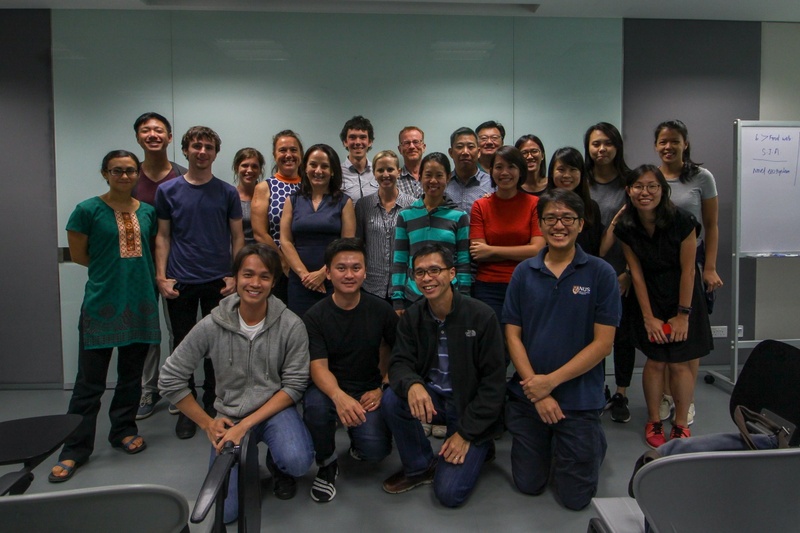 Researchers from UQ, the Australian Research Council Centre of Excellence for Environmental Decisions (CEED), the National University of Singapore (NUS), and staff from the Singapore National Parks Board (NParks), met in Singapore on February 8-9 2018 with an aim to strengthen the collaborative links in conservation science between these institutions. 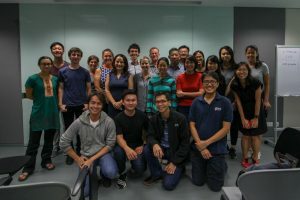 Scientists and managers from NUS and NParks gave talks providing an overview of Singapore’s current conservation and parks management arrangements, and discussed research needs and challenges. Six speakers from UQ (Kerrie Wilson, Angela Dean, Marie Dade, Micha Jackson, Jeff Hanson and Chris Baker) then delivered a well-attended public seminar focussed on applying decision science to conservation. A day of workshopping followed these presentations and aimed to identify the relative needs, strengths and areas of research expertise across the institutions, and to identify potential areas of and mechanisms for research collaboration. Particular focus was given to novel ecosystems, coastal development, and urban green infrastructure. Strong collaborative potential were identified across all themes. Following the workshop, UQ visitors were treated to an outing at the Labrador Nature Reserve hosted by NParks staff. 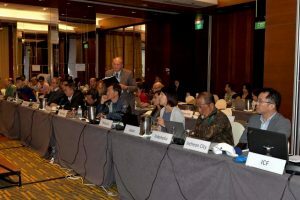 “The two days provided important insight into the significant challenges of reconciling development, human needs and conservation goals in the Asia Pacific region” says Kerrie Wilson, Professor at UQ and Director of CEED. “By collaborating across academic institutions and with government partners we will be much better placed for finding solutions to their challenges”. Special thanks goes to Dr. Kwek Yan Chong and his research staff for their instrumental effort in organising the workshop. I grew up in a small city in the Andes of Colombia, where during my teenage years the local Museum of Natural History fueled my passion for the natural world. That museum, far from being on the list of the world’s most famous, is humble, but filled with specimens that extremely well represent the current diversity of vertebrates in my country of birth. I have ever since been fascinated by museums of natural history, where a new experience has made me even fonder. Recently, I had the opportunity to visit the American Museum of Natural History in New York City for the first time, whilst undertaking a fellowship at Princeton University. After this experience, museums of natural history will never be the same to me. When I arrived at the museum and found myself a map, I didn’t know exactly where to start or what to expect. All I knew was that I was in one of the world’s most famous museums of natural history. Quickly, after unfolding the museum’s map by the foyer, I realised that the top floor was dedicated entirely to fossils. So I made my way upstairs, bypassing all the artistic, and perhaps now historic, dioramas. When I arrived at the fossil collection, I realised that before my eyes was the very story of vertebrate evolution, as close as I could possibly get. It was like once again reading all of my undergrad text books on vertebrate zoology. 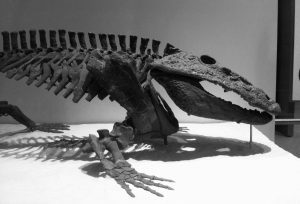 Most of the quintessential fossils that have been fundamental for shedding light on vertebrate evolution were there. Key breakthroughs in the evolution of vertebrates include: the development of jaws, the colonization of the terrestrial environment, and the conquering of the skies through active flight. The fossil collection gave me the opportunity to see iconic specimens representing the evolution of different lineages at various stages. For instance, I found a specimen of Dimetrodon, a synapsid reptile forming the basal lineage of mammals. I also found Hesperornis, a toothed bird that has enabled us to understand the evolution of modern birds. 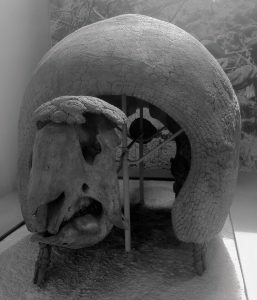 In the hall of mammals, there were specimens of Glyptodon (a giant armadillo), Megatherium (a giant ground sloth), and Dyprotodon (a giant wombat), all of them part of the Pleistocene megafauna. Hence, I came to realise that big museums of natural history are always worth a visit wherever you are, not precisely because of the opportunity to see extant animals, but rather extinct ones! After all, zebras and polar bears are still roaming the earth as we speak, but fossils represent a sample of the earth’s life history that is no longer with us. Museums of natural history with good fossil collections are a lens through which we can explore the exciting history of life on earth. As a part of my PhD at the University of Queensland, I’ve recently had the opportunity to visit Beijing, where I could explore the city on the weekends. After settling in, I quickly found out about the existence of the Paleozoology Museum of China in Beijing, which is affiliated to the Institute of Vertebrate Paleontology and Paleoanthropology of the Chinese Academy of Sciences. Thanks to the media I had good reason to believe this museum was worth a visit. National Geographic magazine had published on its front cover of July 1998 news about feathered dinosaurs discovered in China, all of which have become crucially important in supporting the dinosaur origin of modern birds. Consequently, I didn’t hesitate to go for a visit. 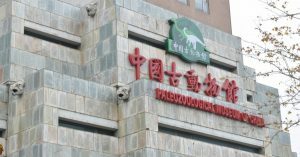 As its name suggests, the museum is fully dedicated to extinct animals. With that in mind, I entered the building with high expectations of finding feathered dinosaurs. Not far from the main entrance, I was inside the so-called dinosaur hall, where I found a fine collection of fossils from the early Cretaceous (130 mya), resulting from obliteration by an erupting volcano. This sample has been dubbed as the “Jehol Biota”, and represents the assemblage of fossilized animals and plants that once lived in Liaoning Province in northeast China. The collection includes fishes, amphibians, reptiles, and mammals, as well as basal flowering plants. Amongst the reptiles there are a few specimens of feathered dinosaurs, exquisitely preserved in slabs where feather prints have been captured. Specimens of now well-known dinosaurs include Microraptor and Confuciusornis. Whilst the former is special because it has feathers present not just in its forelimbs but also in its hindlimbs, the latter is the earliest toothless beaked feathered dinosaur found to date. After spending a couple of hours wandering through the museum, I asked myself, wouldn’t it be nice to have the opportunity to see all these great animals alive? Well, some people have dreamed about it, such as in Michael Crichton’s novel Jurassic Park. But beyond that, I may just settle for the dream and let my imagination travel back in time to the various times in the history of earth represented by the various fossils in front of me. I then realised how wonderful life is, it is just not possible to fully describe its value, or why it is so important to us. Yes, animals and plants have provided food, medicine, shelter, clothes, and many other goods and services to our species now and well into our earliest origins. But standing in those halls, where the history of vertebrate evolution is right before my eyes, as I imagine Pterosaurs soaring the skies, I reflect on the fact that maybe I don’t wish any animal from the past to be back. After all, they are now extinct and that has been the unchangeable course of events on earth. Instead, what I did consider is that as a society and individuals, we are extremely privileged to have the opportunity to be amazed by a time slice of the wonderful life’s history as it happens. After all, standing in those halls full of fossils, which once were real animals, is like watching humpback whales breaching, or shorebirds departing in their arduous migrations. There is simply no explanation as to why we are amazed by life, I just feel so excited about it. Maybe it is because the diversity of life, now and well into the past, is a story of fantasy, one where magic is even greater than in the most elaborate sci-fi novels. Partly perhaps because all that is left from animals in the past is primarily their skeletons, eggs, and footprints. I don’t really need Avatar and other sci-fi movies to let my imagination fly. To me it’s enough to read books about vertebrate paleontology, or visit museums of natural history teeming with fossils. Come work with us! We are advertising for a postdoc to work on migratory species conservation. Primary responsibility is working on an ARC-funded project on migratory shorebirds, but with plenty of freedom to go wherever the ideas take us! The University of Queensland is a world leading university in Ecological and Conservation Research, with more than 100 staff and students working in the Centre for Biodiversity and Conservation Science. 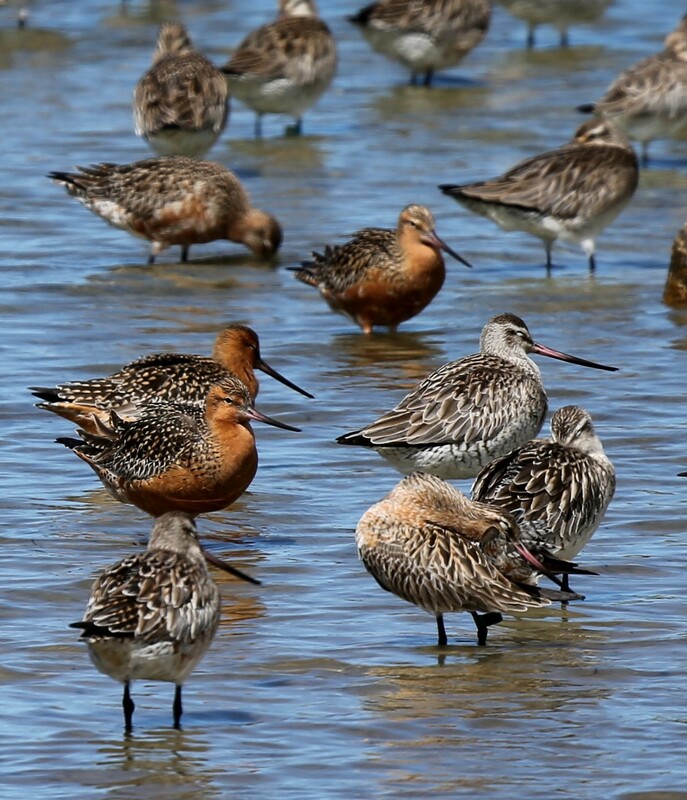 Migratory species are in rapid decline around the world, and we are seeking a postdoc to work on a newly funded project aimed at recovering populations of threatened migratory shorebirds in Australia. Seven shorebird taxa have recently been listed as nationally threatened in Australia, and we are seeking a postdoc to work on a newly funded project aimed at recovering these species through designing optimal management strategies. This project is a unique opportunity to build applied conservation analyses to help solve an urgent conservation crisis. We expect this work to lead to high impact publications, and to continue to shape conservation policy in Australia and throughout the flyway. The successful appointee will join a productive and dynamic environment of 100+ conservation ecologists at UQ. The successful applicant will possess a PhD in a relevant discipline, and expert knowledge of applied conservation science relevant to this project. You will need a proven ability to work with large, spatially explicit datasets, and to publish the results of your work in high impact journals. Good written and verbal communication skills are essential, to publicise the results of your work, and to liaise with the NGOs and state government organisations who are co-funding the project. Big Green Island is a part of the Furneaux Group of islands, which are located off the North-east coast of Tasmania in the Bass Strait and are dominated by frequent and fierce winds. 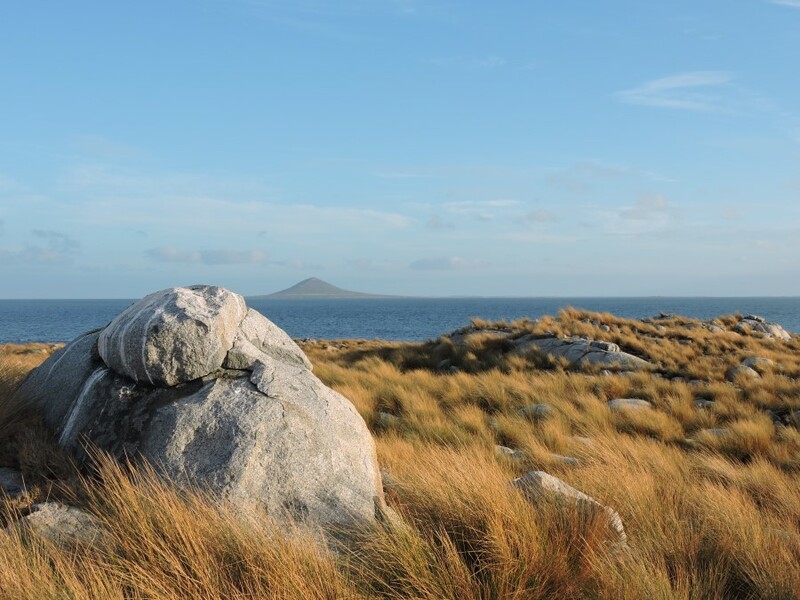 There are over 50 islands in the group, ranging in size from a couple of km2 to over 2000km2 for the largest of the group – Flinders Island, well known for its friendly locals and rugged beauty. Big Green is 3km off the west coast of Flinders Island and is only about 125 hectares (~1.25km2). 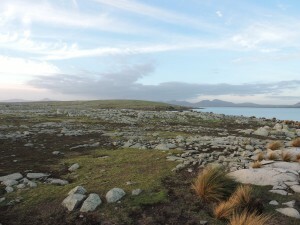 Though the Furneaux group was originally inhabited by Tasmanian Aborigines, by the time Tobias Furneaux (accompanying Captain Cook on his second voyage of discovery; 1773) arrived, it was thought to have been uninhabited for 6000 years. Soon after, word escaped about the hordes of seals in the Bass Strait Islands, and the sealers arrived in the late 1700’s. In 1831 it was decided to use Flinders Island as an Aboriginal settlement for remnants of displaced tribes from the Tasmanian mainland. The Aboriginal people used Big Green as a goose, mutton bird and sheep farm, where they would pinion (cut the birds pinion to prevent flying) the goose to keep them on the island. In the late 1840’s many of the islands were leased (being Crown land) to farmers for running sheep. 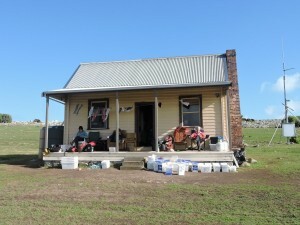 Big Green was not initially leased but was regularly visited for muttonbirding and rabbit harvesting. Black rats (Ratus rattus) became established on the island sometime in the 1800’s. Mutton birds, or short-tailed shearwaters as they are formally known, have been an important food source in Tasmania since colonial times. In 1861 a Mr John Thomas described the island as “more or less a rookery of mutton birds… It is also most valuable as a rabbit warren. I have it on good authority that since last April, upwards of 1,200 rabbits have been taken off by different parties, and they are still so numerous that any person can go ashore and kill with sticks or stones 40-50 in a couple of hours”. In 1865 a widowed Mrs Elizabeth Matilda Davis purchased the island and she began running sheep with her daughter Jane (formally Marie Antoinette Brown, it is not know why she was always called Jane). Elizabeth and Jane built themselves a life on the island, including building a modest dwelling and building stone walls by hand (which can still be seen today). The part of the building that still remains is heritage listed and belongs to the Tasmania Parks and Wildlife Service (PWS). 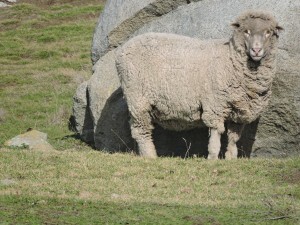 Sheep farming has continued on the island since the times of Mrs Davis (sometimes an excess of 1000 animals were run), which combined with the rabbits – drastically changed the native vegetation. Today the native Poa tussocks have been confined to belts around the west coast and the thistles, nettles and saltbush have been predominantly replaced by exotic grasses (maintained by the sheep grazing). 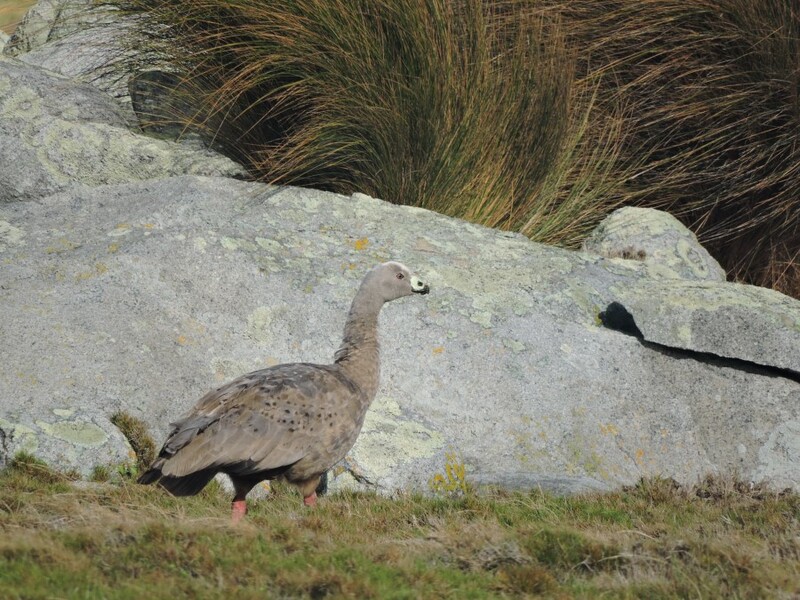 In 1980 the island was sold to PWS and was declared a Nature Reserve, with the goal of establishing a safe place for Cape Barren Geese (the second rarest goose species in the world) to breed, as conflict with farmers prevented this on Flinders Island. Despite being a Nature Reserve, sheep grazing was continued to maintain the short grass, which the geese require. The current grazing lease belongs to Dennis Cooper, who maintains around 400 sheep on the island. 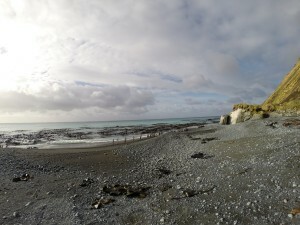 Today, the island is a significant breeding site for the geese, and around 22,000 pairs of short-tailed shearwaters and 400 pairs of little penguins breed on the island. Though the rabbits have long since died out (due to harvesting and drought; 1914), until six weeks ago up to 20,000 black rats continued to compromise the ecological and agricultural values of the island, where they opportunistically predate upon seabird chicks/eggs and consume a large proportion of seed. The current leasee (Dennis) has made sporadic attempts to control the rats since 1984 using bait stations and rodenticides. On the 7th of March 2016 PWS began an ambitious eradication program to permanently remove rats from the island. 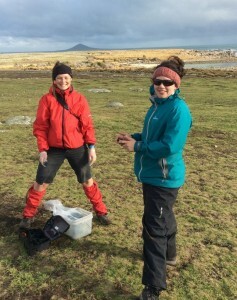 The plan was devised by PWS staff (notably Sue Robinson, who has vast experience in controlling invasive species) and eradication experts from New Zealand (the world leader in island eradications). 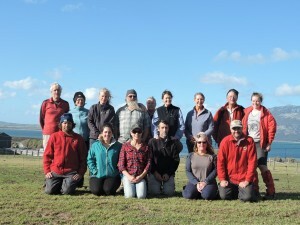 The project has been largely supported by the Pennicott Foundation (Pennicott Wilderness Journeys are world famous for their ecotourism journeys from Bruny Island and the Tasman Peninsula). 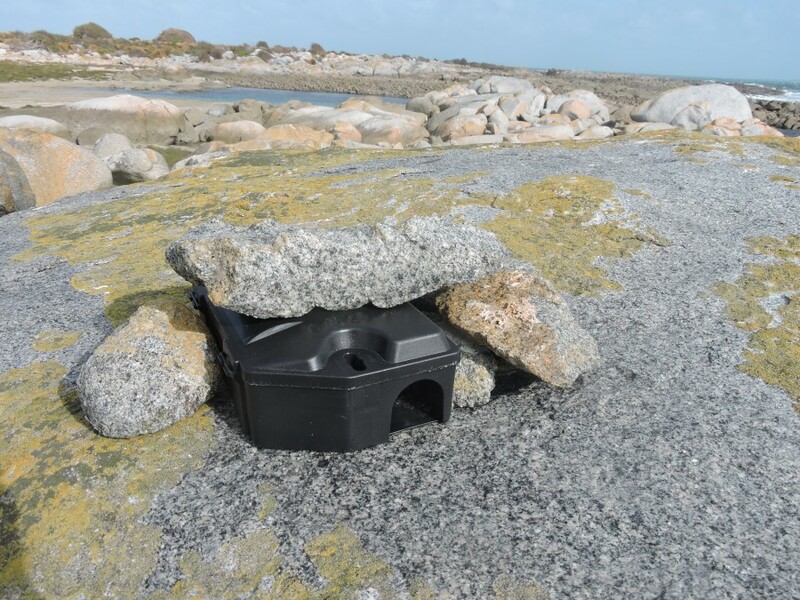 Under the excellent leadership of Sue, over 2,100 bait stations were installed by volunteers in a 25m x 25m grid over the entire island, including the two islets on the north of the island and also on the offshore rocky outcrops, commonly referred to as ‘The Reef’. Baits are deployed in stations to minimise impact on non-target species (such as pacific gulls). 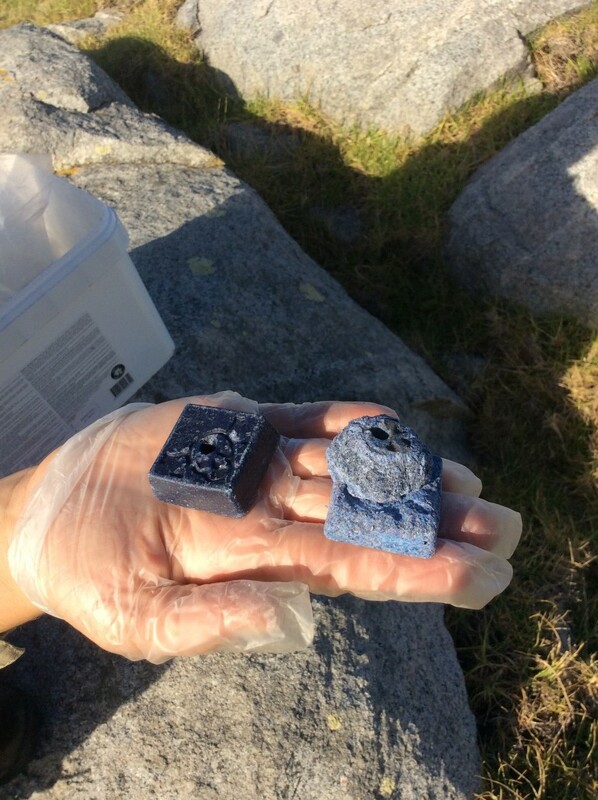 After allowing enough time for the rats to habituate to the stations, a second group of volunteers arrived to bait the stations with blue wax ‘Talon’ baits (the active ingredient is broadifaccoum, which is an anticoagulant). Though it can take them 3-4 days to die afterwards, Talon will kill rats with a single meal. 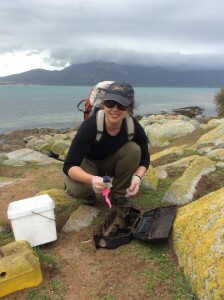 Rebaiting of stations continued for 3 weeks until I arrived at the small airstrip in Bridport (north-east Tasmania). Along with nine other volunteers, I flew from Bridport to Flinders Island on a chartered light-aircraft with pilot Frank. We arrived on Flinders and explored the tiny town of Whitemark (named because of a white mark), where I was fortunate enough to meet the local celebrity – Derek the wombat. Soon enough we faced the windy weather and rough seas and were off on an ‘exciting’ boat ride to Big Green. 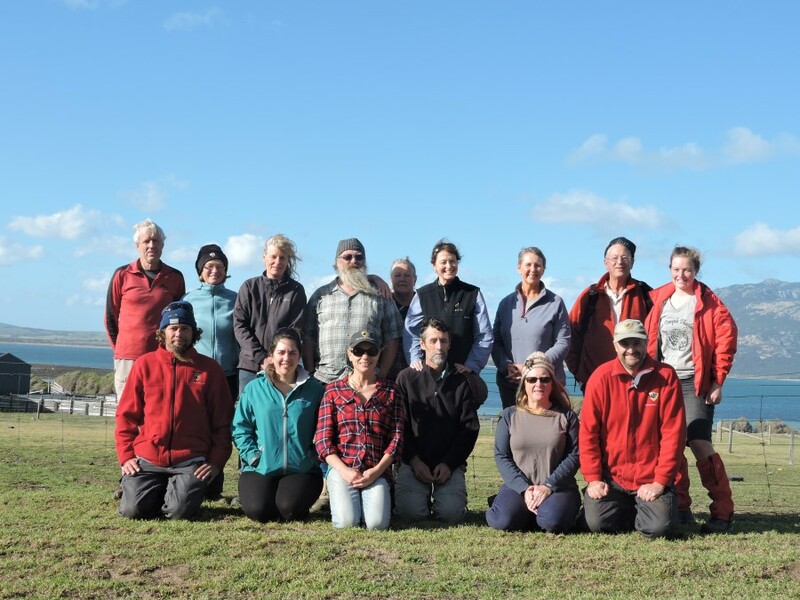 We were met by an extensive welcoming party including the General Manager of PWS Peter Mooney, Rob Pennicott and his staff from Penicott Wilderness Journeys, and the ragged, albeit smiley volunteers, undoubtedly ready to get off the island and find a warm and dry bed. Of course it began raining as soon as I started to pitch my tent, sheltered behind large non-native African boxthorn (the only trees on the island), and though they provide good shelter from the elements, they are not particularly friendly. Despite the weather we enjoyed a cheerful and memorable night with a potentially record-breaking party of 21 people on the island for the night. The highlight was watching the BBQ catch on fire (cheers to David for the excitement). The following morning we were down to business and were soon off for training with Sue and Ranger Mark. After the departure of the VIPs that afternoon we quickly settled into routine and got to know one-another. Asides from myself, there was fellow PhD candidate Laura (also from the Antarctic Division), Diane who is an artist and a member of Tasmania’s Wildcare, Tony – a world-traveller and an engineer from Melbourne, Chris and Irene (Chris worked for Parks for 30yrs, following his participation in the Franklin campaign to prevent the damming of the Franklin and Gordon Rivers in south-west Tas), Cathie and David (Cathie also contributed to the Franklin Campaign and numerous other conservation projects in Tasmania), Leonie and Adrian (Adrian is a water race enthusiast and Leonie finds that water races conveniently turn up whenever Adrian plans an adventure), Sarah and Ranger Mark (currently enjoying the fishing on Flinders Island), Kerrie and Ranger Luke (Luke has worked on the eradication programs on Tasman Island and Macquarie Island), and of course – Sue (chief of this operation). Over the next couple of days we deployed more talon and monitored for ‘nibbles’. Everything is recorded via an excellent app (Fulcrum), which we used on the ‘field’ iPads. The island is divided into 19 sections from north to south, each of which I became quite acquainted with over the ten days. In the first couple of days we found that uptake was extremely low (excluding one or two ‘hotspots’), indicating significant progress had already been made since the initial deployment of the baits three weeks prior, where the uptake was through the roof (4 baits were deployed in each station and had to be regularly replaced). In contrast, we cut down the number of baits in each station from 4 to 2 in coastal regions and 1 inland. However, we were eagerly awaiting the arrival of the new chocolate-flavoured bait (which we aptly nicknamed ‘death by chocolate’), so that we could deploy it and hopefully catch any of the rats that were ‘blue-phobic’ (aka not attracted to the Talon). In the meantime the island maintained its reputation as being rainy and windy, and we ‘unfortunately’ were at times constrained to the tiny two-room heritage building to play cards and plan elaborate meals. I must say, due to the exceptional number of experienced cooks, we ate extremely well on the island (too well you might even say, if you counted the amount of chocolate we consumed). We were also entertained by the old newspapers on the walls, where Mrs Davis and her daughter had plastered the walls to keep the draughts out. 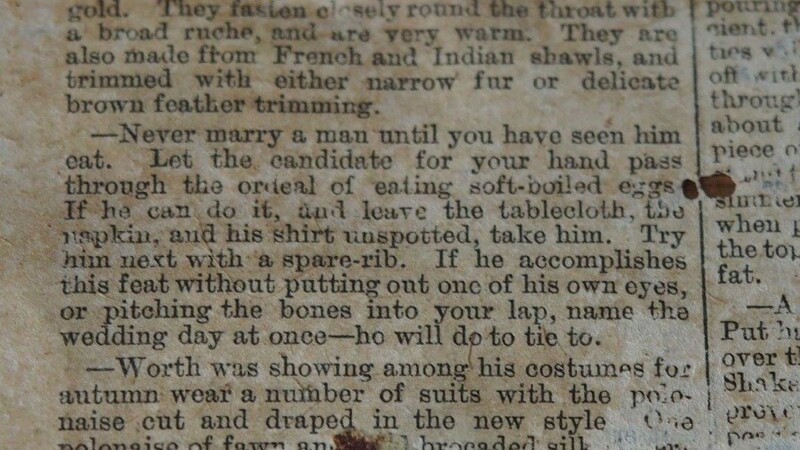 There were such gems as ‘How to get a husband’, which consists of watching men eat soft-boiled eggs (I won’t ruin the ending – you have to look at the photo). 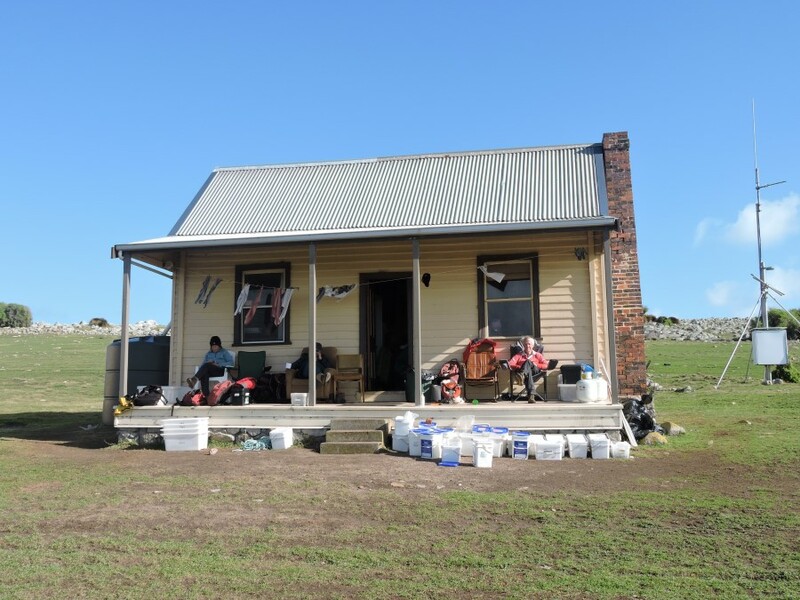 Severe weather warnings meant that the shearing shed became a dry utopia for some of our crew, where they would rather face the sheep smell than the wind and rain. 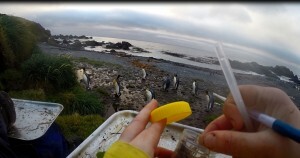 Fortunately, my little tent proved to cope with the gale-force winds and hectic rains extremely well (thanks for the birthday present mum), and I was able to ‘enjoy’ being woken up by the little penguins at midnight and 4am multiple times (no really, I actually did quite enjoy it). 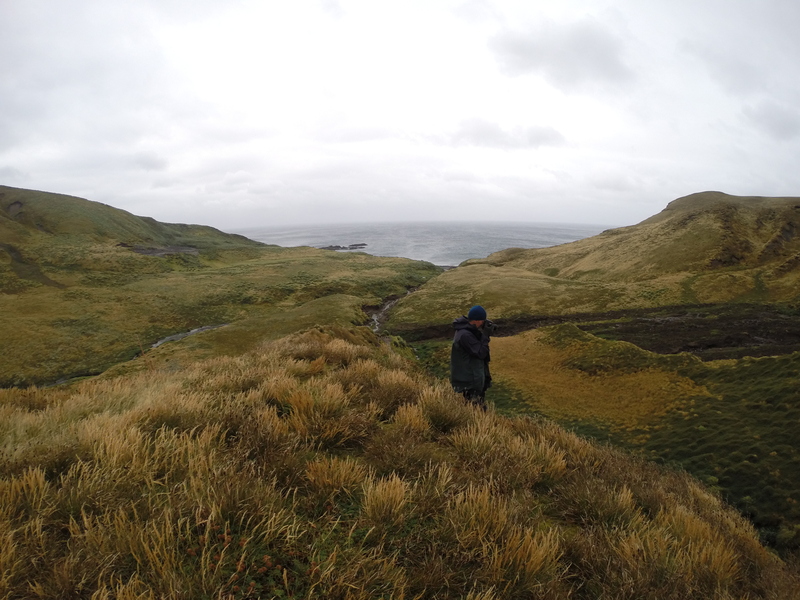 Just so you can better picture the conditions, at one point Laura even checked the weather and informed me that it was windier on Big Green than it was on Macquarie Island… Of course Irene informed us that the previous group of volunteers had worse weather than us. Our nights normally consisted of a good feast, arguing over who got to do the dishes (seriously you had to be fast if you wanted to do dishes), gulping down some chocolate (or custard and apples) and waiting for Ranger Luke to entertain us. He did an exceptional job, where I am now well informed about the Tasman Island cat eradication, and enriched by hearing about some extraordinary wildlife encounters and interesting hobbies. These included rescuing stranded sperm-whales (Chris) and collecting old bicycles (and dusting them when required: Luke). Not to mention water races, whale sharks and cave spiders. Our eagerness in getting all the new baits out meant that by the time Saturday rolled round we had little to do except for some casual monitoring. The day was spectacularly beautiful – not a cloud in site and for once no wind. We therefore hosted a cleaning party (ready for our departure the next day), ate as many pikelets as possible, snuck in some sneaky reading and games of crib, and explored the island at our leisure. For me this meant navigating the perimeter of the island stopping whenever I felt inclined to take a photo or watch birds, and checking bait stations whenever I practically walked on top of them. Pleasantly there was not a single rat nibble that I found, though sometimes the Talon was crawling with invertebrates. Turns out invertebrates like wax baits (they are able to metabolise the toxins). Our hotspot was also quiet – no new uptake. By the way the current record for bait consumed from a single station is 22.7 baits (thanks for the data updates John and Phil). 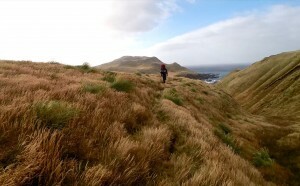 Though covered in sheep, the island is still extremely beautiful and I thoroughly enjoyed my time romping about the tussocks and among the mutton bird burrows (unfortunately, or perhaps fortunately for them the mutton birds had already left on their migration north). For the bird enthusiasts, I recorded twenty-two bird species on the island over the ten days, including some which were new for me (Cape Barren Geese, white-fronted chat, double-banded plover). 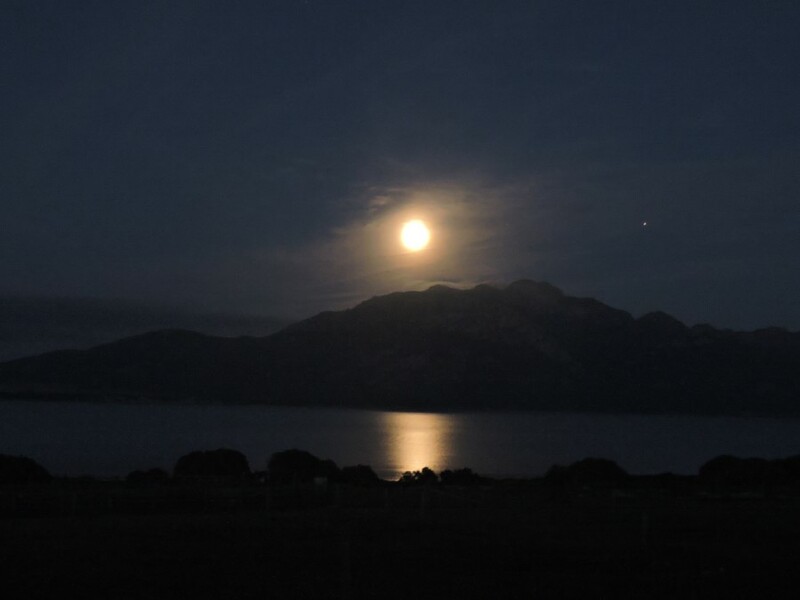 The remoteness is peaceful and there were glorious sunrise/sunsets every day, not to mention a spectacular moon-rise over Mt Strzelecki (across the channel on Flinders Island) for our final night together. Sunday morning meant our time together was coming to an end and it was time to depart. 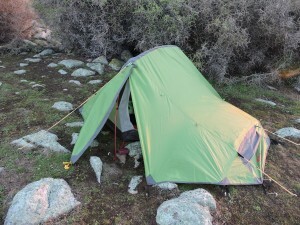 Of course our tents were wetter than they had been any morning on the island (the most dew I’ve ever seen). 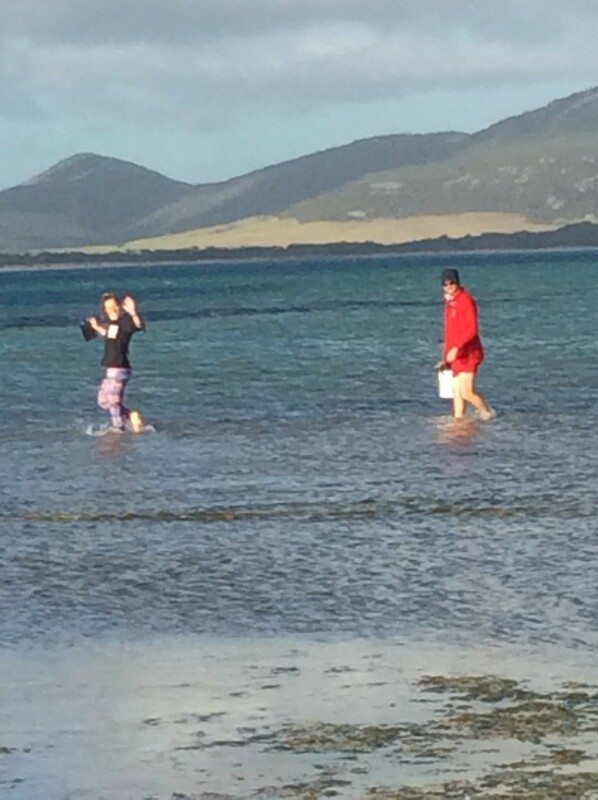 We all stood together watching the boats approaching to take us back to Flinders and I knew it was unfortunately time to go back to the real world (aka PhD life). In early June another group of dedicated volunteers will arrive on the island to begin the monitoring phase of the project. 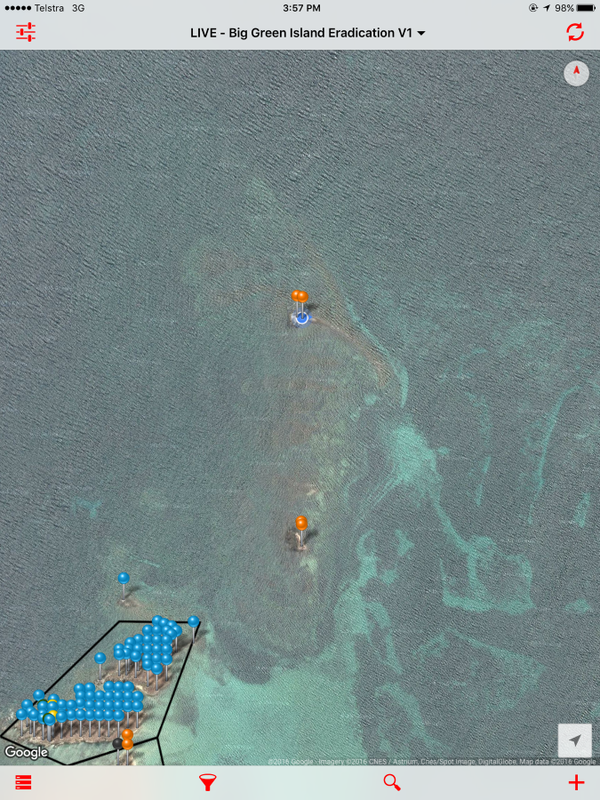 Though we hadn’t seen hide-nor-hair of any rats in the last few days of our trip, monitoring the island for activity is an extremely important aspect to ensure the long-term success of the project. They will do this via a variety of measures, including monitoring the stations and deploying peanut-butter cards, which are plastic cards dipped in peanut butter (rats love peanut butter and will chew through the plastic to get the peanut butter). I’m hoping they don’t get any nibbles at all, which will be a very good sign for the wildlife of Big Green Island. 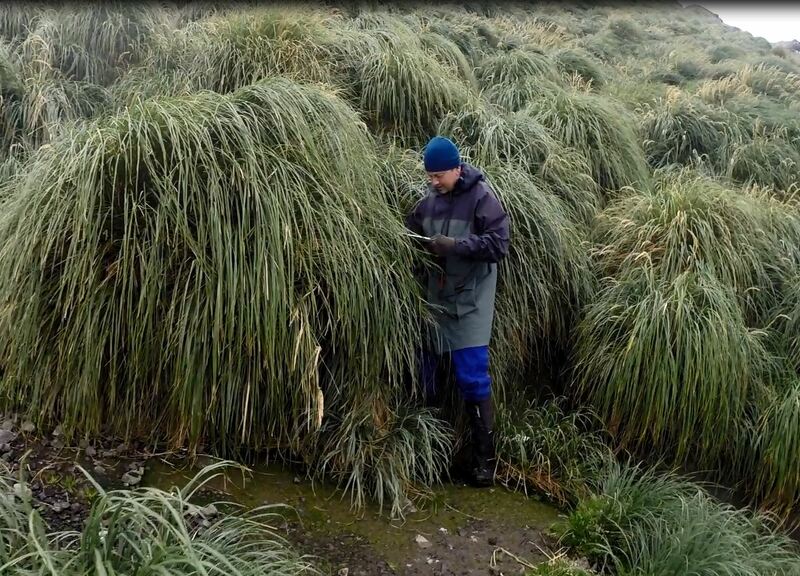 Hopefully the eradication of rats will help the vegetation to recover and increase the breeding success of seabirds. Two years post baiting Sue will take the rodent detector dogs and deploy camera traps to verify that rats have been successfully eradicated. Now back at my desk at the Antarctic Division I am extremely grateful to have had the opportunity to participate in such a project, where I was able to gauge conservation success with my own eyes (something that is often hard to do with desktop conservation projects). I loved the island and immensely enjoyed spending time with such wonderful and inspiring people. I have no doubt the success of such projects is underpinned by the dedicated teams of volunteers and staff. Since the beginning of this project, volunteers deployed 2,215 stations, made 21,104 observations, deployed 24,018 baits (480kg) and had 10,544 baits eaten (211kg). And I have no doubt the next group of volunteers will do an equally stellar job. I am one of the luckiest people imaginable. 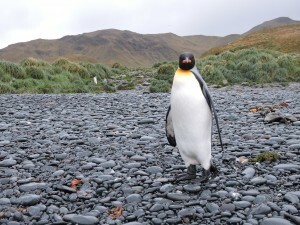 Someone told me a couple of weeks ago that fewer people have been to Macquarie Island than have climbed Mt Everest; interesting statistic, though what it fails to convey is that Macquarie Island is also surely one of the purest and most strikingly beautiful places on the planet. Due to the islands world heritage protection and ‘edge of the world’ remoteness, not many people do get the opportunity to visit such a unique place. Hence I was extremely privileged to have the opportunity to see the island in all its glory. 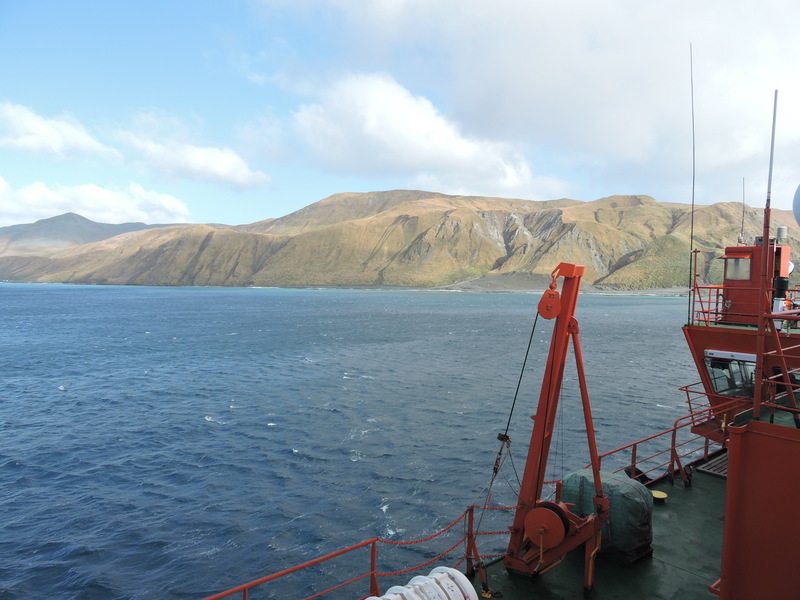 We set off from Hobart on the 6th of April in the Aurora Australis, as a part of the annual Macquarie Island resupply, termed V4 (voyage four). The Aurora is Australia’s Antarctic icebreaker and it was nearly at capacity, carrying 114 crew and expeditioners, not to mention IRB’s, LARC’s and 4x squirrel helicopters for the resupply. Acronyms run rife here, but once you get a handle on them, it’s not so hard: IRB is inflatable rescue boat and LARC’s are an amphibious truck/boat. The resupply is hugely important from a number of perspectives, and this year was set to be particularly critical after complications in the 2014 resupply. 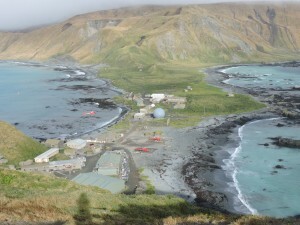 The station needed to be refuelled (which was critical), the plateau huts used in the pest eradication program (read more about this here) were set to be removed, the permanent field huts needed resupplying with food and fuel, all rubbish needed to be removed, and of course there was the round trip science programs to be undertaken. The 2014 wintering team also needed to do a hand over to the incoming winterers. 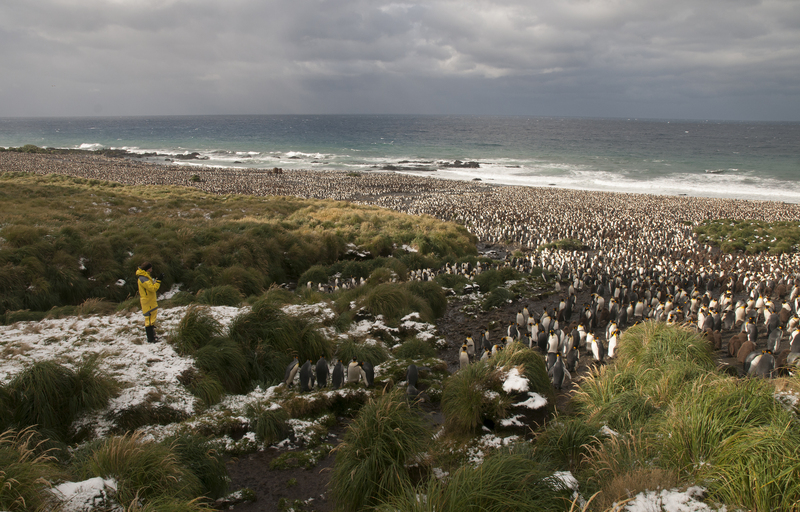 Winterers stay on the island for a year, carrying out scientific duties and maintaining the station. 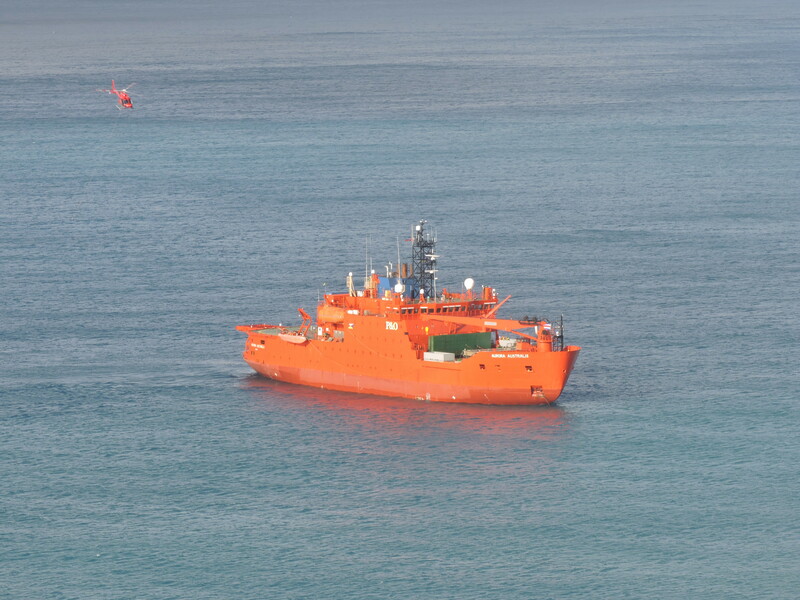 A round tripper is an expeditioner on board just for the resupply. My round trip assignment was to assist one of my PhD supervisors to collect live collembola samples, or springtails as they are commonly known. Dr Aleks Terauds works for the Australian Antarctic Division in Hobart, where he has a number of research interests, including understanding biodiversity patterns on multiple scales, conservation of the Antarctic and sub-Antarctic and springtails, of course. Ship life ended up being incredibly enjoyable for me, as I was fortunate to not be sea sick. Life on a ship practically revolves around feeding periods, where breakfast is 0730 – 0830, lunch 1130 – 1230 and dinner 1730 – 1830. After several days on the Aurora – spent productively working on my PhD (of course), playing trains (a board game based on building train routes across the US) with other expeditioners, doing a large amount of birding for pelagic seabirds and don’t forget eating, we arrived into Buckles Bay at Macquarie Island on Thursday afternoon of the 9th of April. Though it appeared sketchy for awhile, Aleks and I were off on one of the choppers that afternoon, and were welcomed into the Macquarie Island ANARE (Australian National Antarctic Research Expeditions) station to spend our first night on the island. 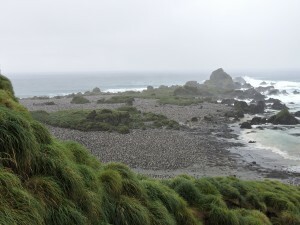 2015 will mark the 68th ANARE season for Macquarie Island, where the years have marked a number of changes, most notably the successful eradication of cats, rabbits and rats from the island. After a field briefing with Ranger Chris and a good feed from Benny the chef we were off to bed to get in a good nights sleep before our little ‘walk’ the next day. Little could I imagine it would also mark the night of my first aurora viewing. Needless to say, this was a pretty special experience – as I have longed to see the Southern Lights (Aurora Australis) for a good number of years, and though starting out slowly, it did not disappoint – with a number of arcs and bands dancing across the sky in various shades of green and white. Surely there could be no better start to a field trip than this remarkable welcome. 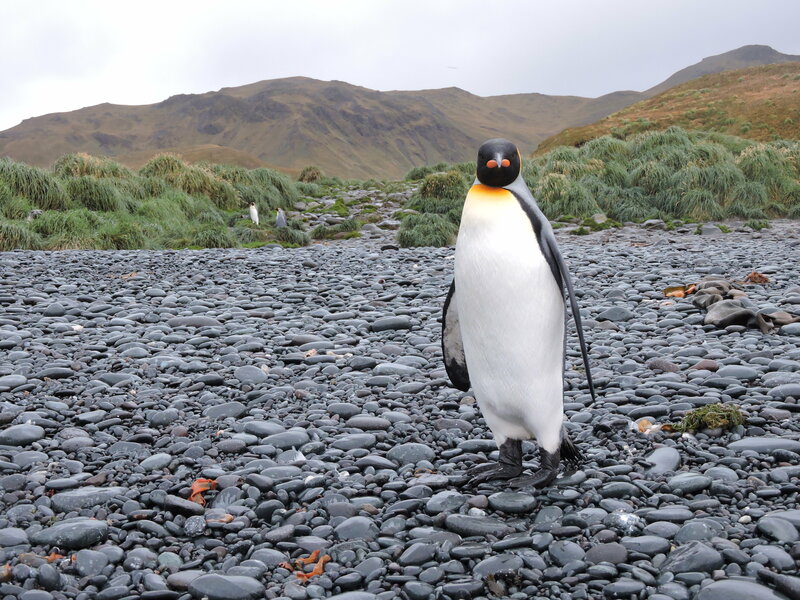 Our first days hike consisted of walking along the east coast of the island, where I saw my first gentoo, royal, and king penguins, elephant and fur seals, and a variety of seabirds including northern and southern giant petrels. The scenery was indescribably beautiful, the wildlife ever pleasing and Aleks was constantly delighted with the good recovery of the islands vegetation after the rabbit removal. We cut inland at Finch Creek (just before Brothers Point), where we stopped to see the royal colony, before continuing on the OLT (overland track) the rest of the way to Green Gorge hut (halfway down the east coast of the island). 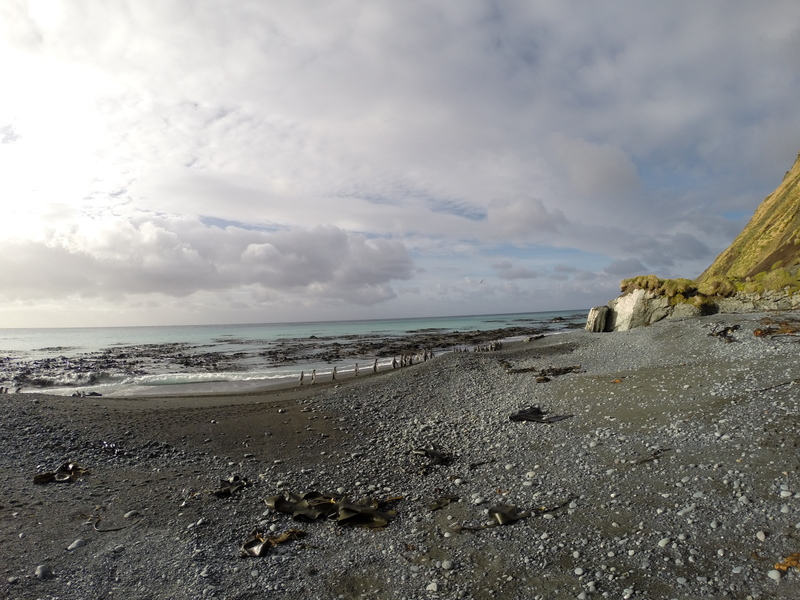 Of course, we stayed dry the entire day, until being hit with a little sleet storm within sight of the hut, but anyway I wouldn’t have got the full Macquarie Island experience if our trip was to be only sunshine. The Green Gorge hut could not be better situated (over a beach of king penguins), and I was only too pleased to spend some time enjoying their company and taking photos. 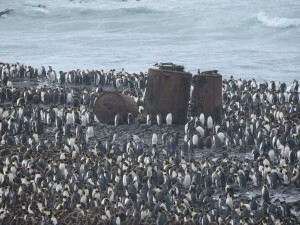 Upon arrival at the hut we were also informed that there was lone rockhopper penguin blending in with the kings, thus allowing me to see all four Macquarie Island penguin species on my first day. Brilliant! After a refreshing night spent with Rob, Madeleine and wildlife ranger Anna at Green Gorge, we set off on the OLT for Hurd Point. The plateau is stunningly beautiful and it was a pleasure to trek the ~20km to Hurd, passing by a number of crystal blue lakes – which always looked deceptively inviting to swim in. Though the day began in sunshine, it soon turned to snow, which was surprisingly pleasant (as it meant little wind). The variation in weather on the island was a constant source of amazement and amusement for me, where the landscape would change drastically from day to day. It is hard not to have a begrudging respect for the vegetation that survives in sub-Antarctic climates, coping with extreme temperatures, variable rainfall, sleet, hail and snow. In fact I deeply enjoyed learning the names and natures of the Macquarie Island flora, including the edible Macquarie Island cabbage, the beautiful Macquarie Island Orchid, the very unique azorella, the comely, though invasive poa annua and the every-annoying acaena (which stuck to all manner of clothing). 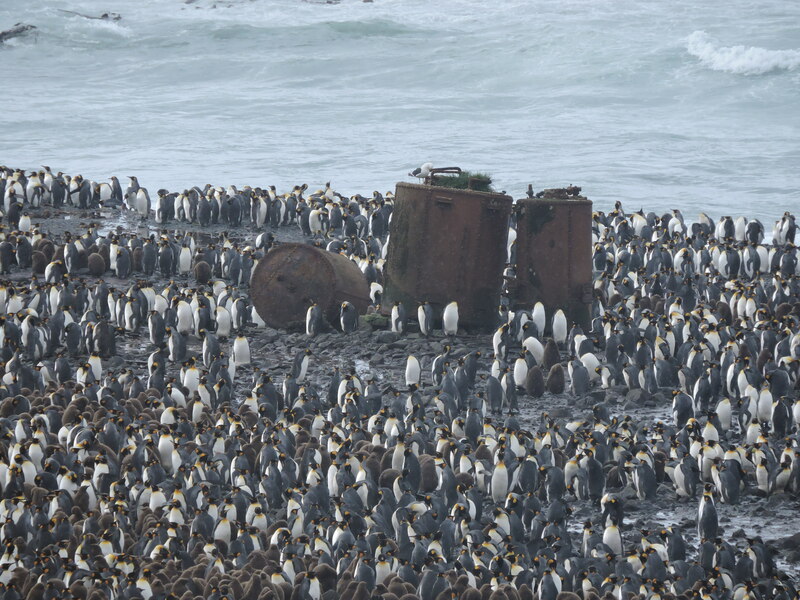 We arrived into Hurd Pt hut late that afternoon, after climbing down the creek to descend from the plateau – which afforded unbeatable views of the Hurd royal penguin colony. Hurd Point forms the southernmost point of the island. The two albatross girls Rachel and Kate, who we were to spend the next three nights with, arrived soon after we did, and after we had sat in front of the heater for a suitable period of time we cooked up and consumed considerable amounts of risotto and chocolate, before a second magnificent aurora viewing. This one was picturesque – just like you see in all the photographs (better even). It’s hard to describe something more magical than colourful lights dancing across the sky, in fact I was enjoying it so much I forgot to even try and take a photo. Day 3 consisted of a hectic climb back up to the plateau (cheers to the intrepid alby teams that climb the jump up every day) and a hike to Luisitania Bay to collect springtail samples. Lusi Bay is location of the largest king penguin colony on the Island and consequently, also served as one of Joseph Hatch’s penguin harvesting (for oil and fur) sites until 1919, when the Tasmanian government would no longer extend his lease of the land. In one of the earliest demonstrations of an international conservation campaign, Antarctic explorer Sir Douglas Mawson successfully convinced the global public that Hatch forced the penguins to walk up ramps into vats of boiling oil – causing such an outcry that the government was forced to bend. This set a pretty grand scene as I ate my lunch and gazed at the kings gambolling around the giant boiling vats. The trek back to Hurd was made challenging by the onset of a blizzard and I was grateful that I got to follow all of Aleks’ footsteps through the deeper snow drifts. Of course, this meant a well-deserved seat in front of the heater, hot BCJ (black current juice) and gobbling down plenty of chocolate and dried mango (Aleks!). In fact props to Aleks for making a delicious lentil pie while us three girls sat around the heater. Cooking in the field huts requires an innate ability to be creative, as all food must be long life. Hence there is plenty of tins, jars and dehydrated or dried everything. 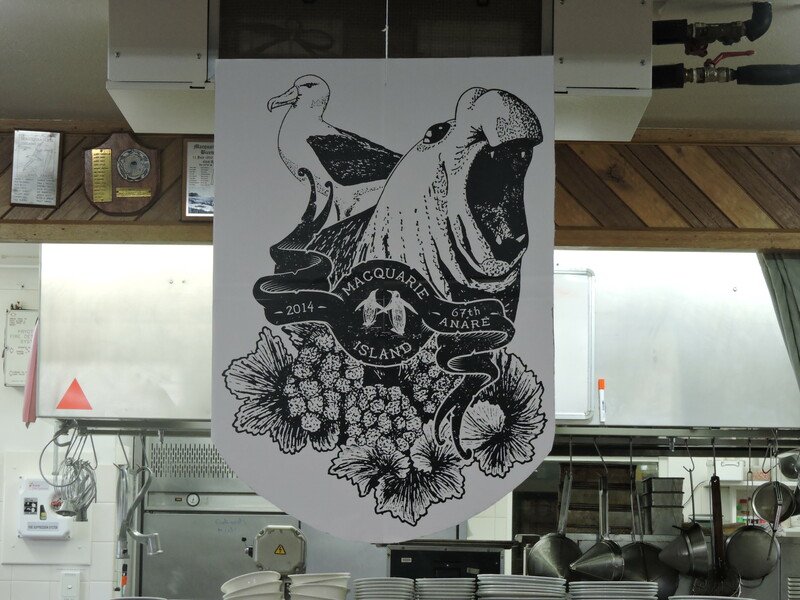 Macquarie Island field cooking inspired the inhabitants to put together their own cookbook, aptly titled ‘How to cook an albatross’, though of course there is no recipes for cooking albatross – plenty for using up the stacks and stacks of polenta though. The following day was a stroll in the park compared to the last few days, where we stuck pretty close to the hut collecting all manner of springtails. Known for their furca, or springer the springtails are a ubiquitous group of hardy survivors, that can, in a single bound spring the equivalent of a human leaping over a 30-storey building. This kind of athleticism, combined with an unbelievable ability to adapt to extreme environments and plenty of striking patterns, means these little guys (up to 20mm) command respect from all who lay eyes on them. Not to be outdone, the other wildlife on the island is likewise spectacular, not to mention innately curious. 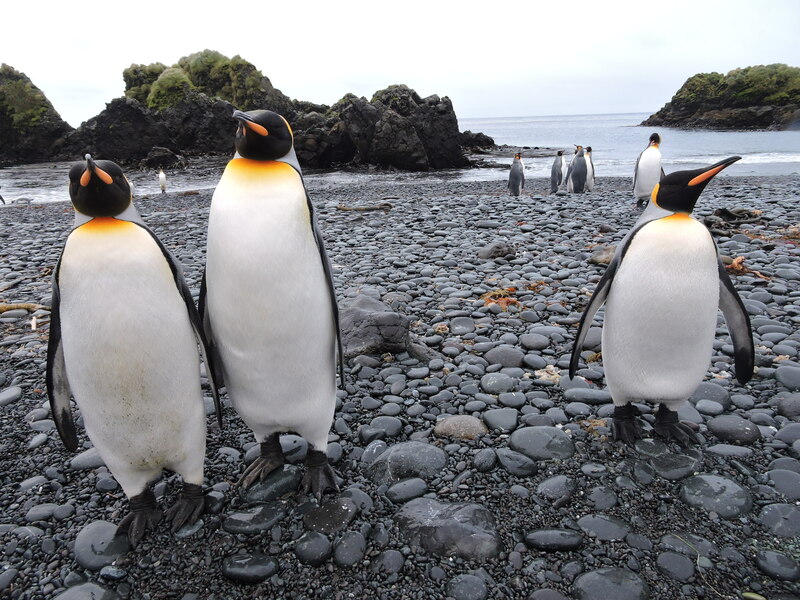 King penguins are happy to encroach on one’s personal space, Elephant seals glare as you pass and the light-mantled sooty albatross glide a couple metres over your head as they check you out. Collecting springtails consists of shaking them out of their tussock homes onto a tray and vacuuming them up using a pooter (a tube with mesh inside to prevent you sucking them all the way up). Collecting springtails turned out to be an activity I immensely enjoyed, and it was a pleasure to have an insight into their ‘micro’ world. Aleks had plenty of excellent springtail knowledge to impart to me and my favourites turned out to be the metallic blue Lepidocyrtus, the large, stripy and ‘hoppy’ Lepidobrya and the ironically named Megalothorax (which comparatively, is the size of a pin-head). The fifth day consisted of the hike back to Green Gorge hut, where the weather was very obliging – providing us with beautiful sunny walking weather. Spending time in the field is simply unbeatable, and I was already dreading going back to ‘the desk’. 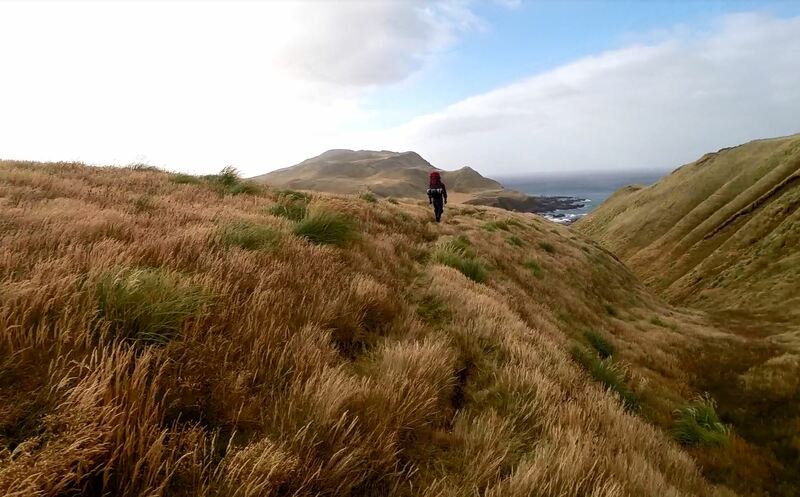 Hiking with Aleks can only be described as ‘being in a documentary’, where his innumerable periods spent in the field and his immeasurable passion has given him incomparable knowledge of the island and its inhabitants (check out his book: Subantarctic Wilderness Macquarie Island). I was blessed to have such a guide, and I tried to absorb as much knowledge as I could, enjoying every second on this spectacular island. Unexpectedly, this ended up being our last day in the field, as a bad turn in the weather meant the ship had to try and leave ASAP (beating the bad weather back to Aus). 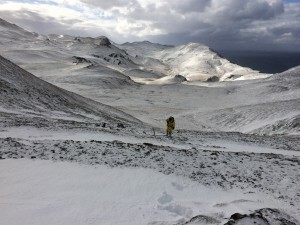 The following morning we were choppered from Green Gorge back to the station, where we undertook some last springtail collections on North Head before being picked up in an IRB to go back to the Aurora. 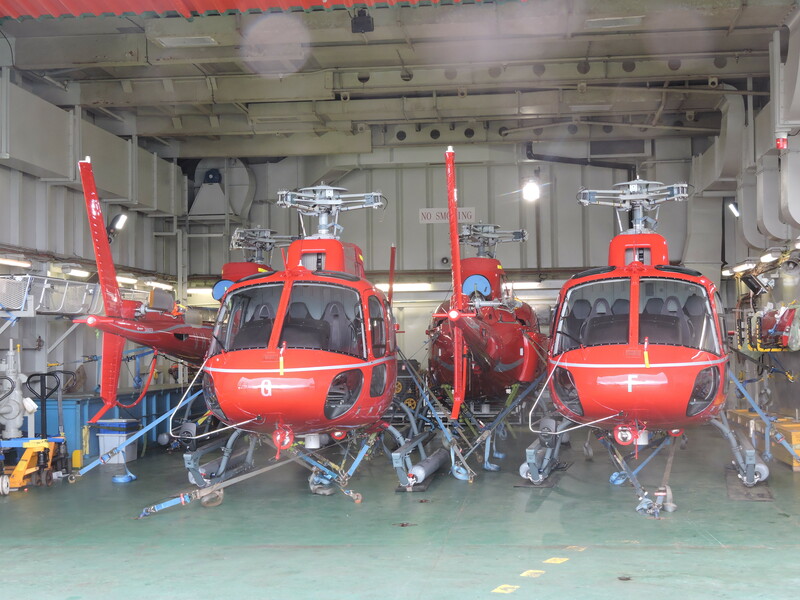 Unfortunately, the crew were unable to get the four choppers onto the ship that afternoon due to the very ‘reflective-of-Macquarie-Island’ winds, and we missed the window to beat the storm back to Aus. This resulted in us spending an additional four days sailing up and down the island, unable to leave due to expected 16m swells en route back to Australia. 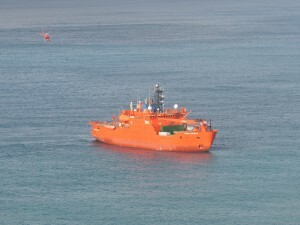 However, I soon settled back into ship life, enjoying being out in the immense Southern Ocean. I found it hard to imagine having to prepare my own food once again, enjoying the excellent cuisine of the ships chef. Particularly the desserts – where every night he would surprise us with something new and delightful, including golden syrup dumplings, eaton mess, brandy snaps, birthday cake and chocolate-dipped strawberries. The journey home also meant some superb seabirds, including 7 species of albatross (wandering, black-browed, sooty, light-mantled sooty, bullers, shy and grey-headed), shearwaters and numerous petrels (including the elusive, or ‘not-so-elusive-on-this-voyage’ grey petrel). In conclusion I will be forever grateful for my experience in this special part of the world (hopefully not my last), which was literally a dream come true (thanks Aleks). I wouldn’t change an instant of our trip. We covered over 95km, took over 144,000 steps, crossed windy ridge in snow, blizzard and sun, saw numerous awesome fauna species and many equally as awesome flora species, collected a wide assortment of springtails, met and befriended heaps of awesome and interesting people, and even managed to get a tan. The whole journey was an awesome opportunity to see some of the landscapes and ecosystems I have been reading so much about. I have also come back with a far-greater appreciation of invertebrates than I have ever had before, and though not a substitute for being in the field, I will now have to look for some springtails in my own backyard. We can all do it – all you need is a tray and a good set of eyes! 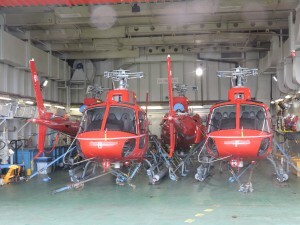 If you want to read more about the Australian Antarctic Division, follow this link. Or if you want to read more about life on Macca – click here. PhD awarded: Dr Nick Murray!! Massive congratulations to Dr Nick Murray, whose PhD has been awarded! Well done Nick, we are super proud of you, the first primary-supervised PhD graduate from our lab. 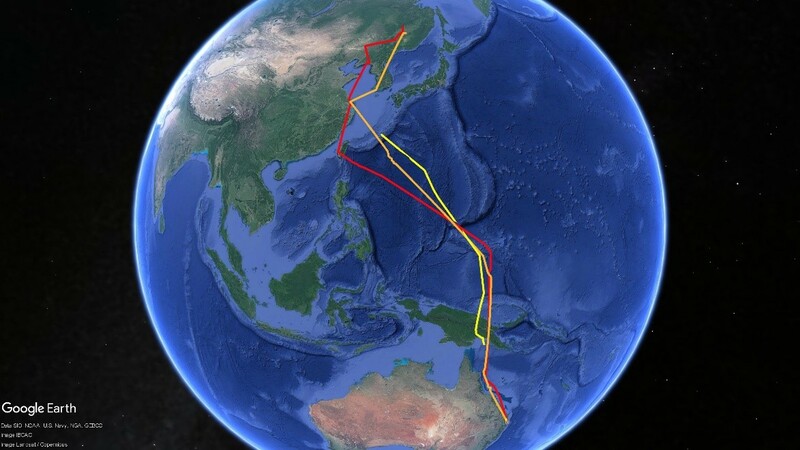 Nick’s PhD on migratory shorebirds and their habitats took him right across the East Asian -Australasian Flyway from Australia to Alaska and many places in between including Cambodia, Indonesia, China and South Korea. He took on a project that was initially branded “crazily ambitious” by experts in the field, and totally nailed it. 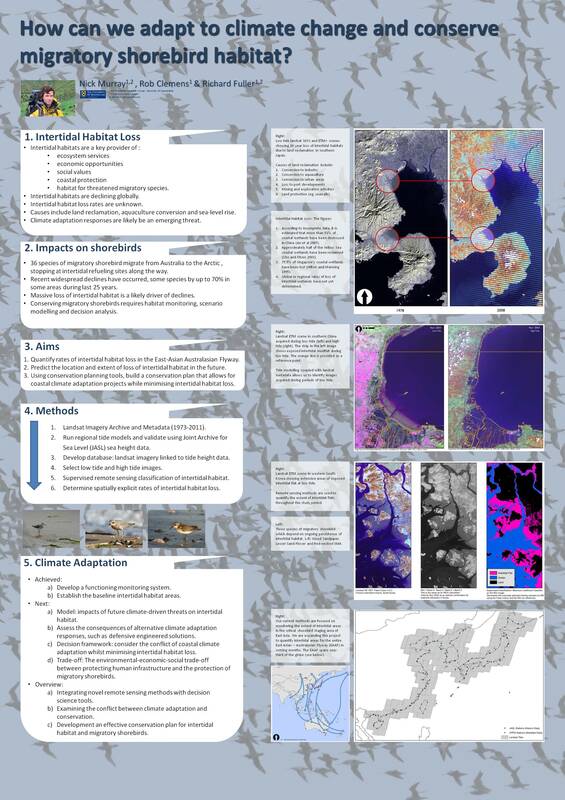 In a series of four papers, Nick developed a new method to map intertidal habitats from satellite data, and used it to reveal massive losses of staging habitat for Australia’s migratory shorebirds in East Asia. This led to Nick show that the entire intertidal ecosystem of the Yellow Sea is at imminent risk of extinction, and that intertidal habitat is chronically underprotected in the Yellow Sea. 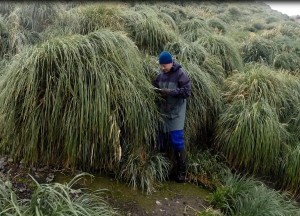 Nick is now a Postdoctoral Research Scientist at the Centre for Ecosystem Science, University of New South Wales, where he works on monitoring ecosystem dynamics, enabling assessments of the status, risk of collapse and drivers of ecosystem endangerment. Tim Cox interviews Rich on ABC Radio 612, but mainly makes fun of shorebirds’ names! Bar-tailed godwit, red-necked stint, terek sandpiper – oh alright, we see what he means. 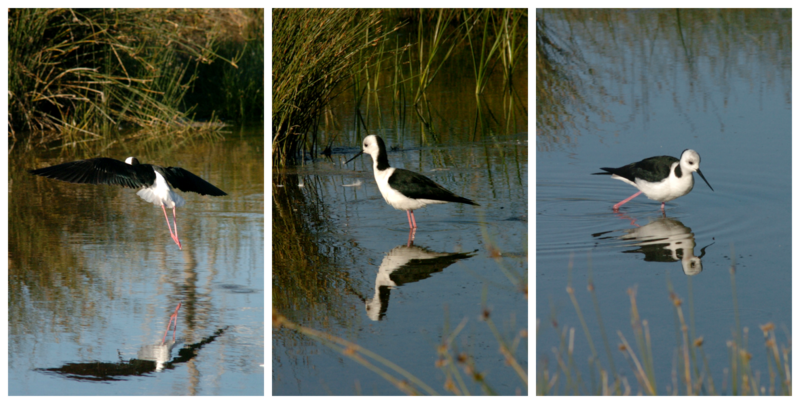 Anyway, we’re saying farewell to shorebirds with BirdLife Australia until 19th April. A visit to the park could save your life! New research from our lab shows that despite the abundance of parks in Australian cities, only 60 per cent of the urban population are using these facilities in any week. This means that 40 per cent of us are missing out on the vast array of health benefits that parks offer, including a lower risk of developing heart disease, stress, anxiety and depression, says Dr Danielle Shanahan. After some months in Australia’s southeast from January through April, six weeks in the Republic of Korea from May on, and two weeks in China in late June, here is a bit of a story about what I have been up to as part of my internship project on policy analysis. 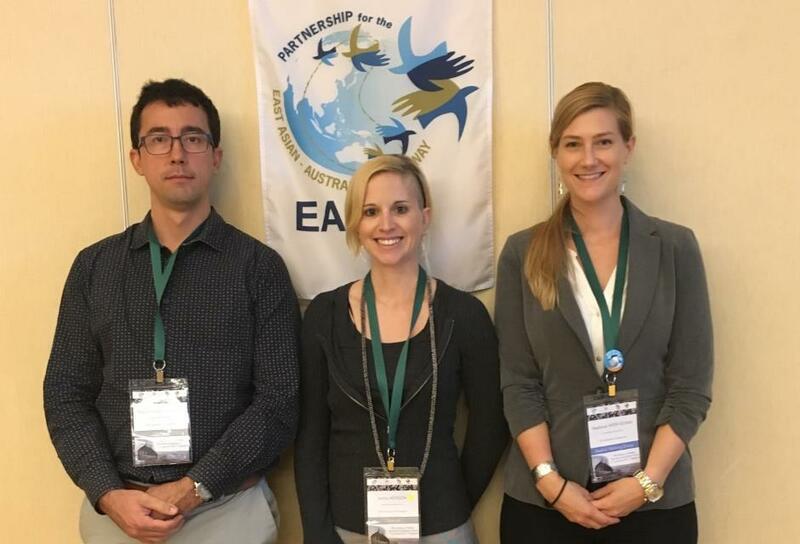 Through my internship at the East Asian-Australasian Flyway Partnership (EAAFP) in the lead up to my PhD at the University of Queensland, I have been taking a very first step towards appraising policy effectiveness for migratory shorebirds. International policies for conservation of this group of birds have been emerging in our flyway since the 1970s, however, little is actually known about their performance. This internship project is primarily focused, as a first stage of policy evaluation, on a comprehensive survey of the international policy framework for shorebird conservation in the EAAF and its domestic implementation in four countries (i. e., Australia, China, Japan, and the Republic of Korea). Ed delivering a presentation on international policy at the National Shorebird Network meeting in Seocheon, Republic of Korea. 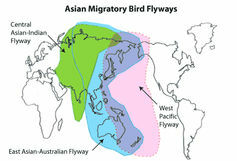 Working on policy analysis has taken me a bit around the flyway. My “field work” has involved talking to people and reviewing policy documents. This has been a very exciting and rewarding task as I have been visiting people in Canberra, Sydney, Seoul, Jeju Island, Nami Island, Seocheon, Incheon, Beijing, and Tianjin. Part of my methods include key stakeholder interviews, which are an approach to have quick access to important and complex information, gain knowledge of policy processes and development, identify variables shaping policy, establish roles of different actors, and obtain expert opinion on policy performance. My target stakeholders have comprised senior officials from research institutions, NGOs, and national government agencies from Australia, the Republic of Korea, and China. So far I have completed over 30 interviews; most of them in person, but a few others have been held via Skype and over the phone. Most interviews have been conducted in English with a few having been conducted in other languages with the help of interpreters. These interviews have taken me to some of the top research institutions in the flyway, key government agencies, important NGOs, as well as to meet very interesting and influential people at national and local levels. As I must abide by best standards of ethics when conducting this type of research, no individual names or institutions can be disclosed, though I am enormously grateful to everyone involved. 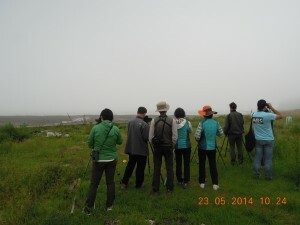 Visit to the Geum estuary as part of the National Shorebird Network meeting in Seocheon, Repulic of Korea. 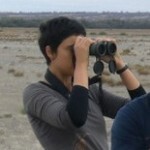 In addition to all interviews, I have been fortunate enough to attend several events related to shorebird conservation. Upon my arrival in Songdo (Incheon, Republic of Korea), I took part in the International Migratory Bird Day celebration, where the EAAFP secretariat did a fantastic job to raise awareness about the conservation of migratory waterbirds, bringing together politicians, school children, and the community at large. Subsequently, I had the opportunity to attend in an observer capacity the advisory group meeting of WWF’s Yellow Sea Ecoregion Action Programme. 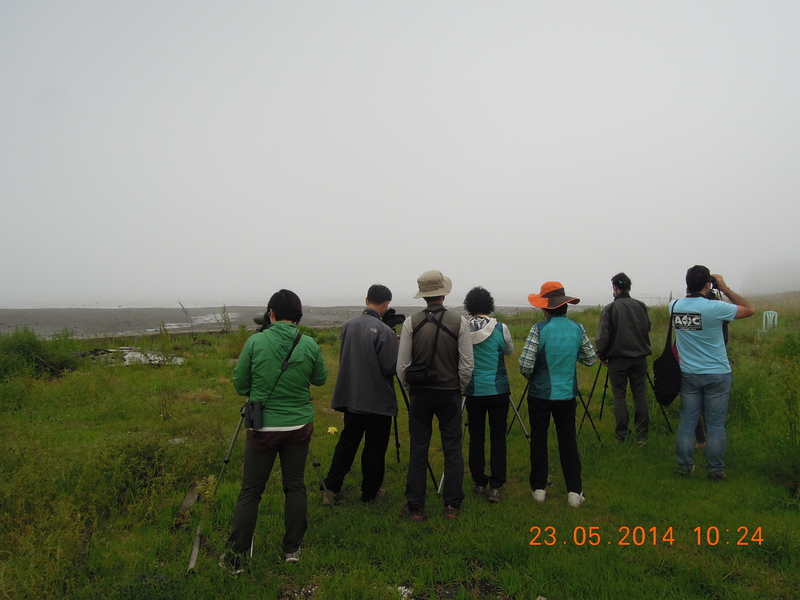 With little time in between, I then headed to the meeting of the Republic of Korea’s National Shorebird Network. As part of this event, I had the opportunity to deliver a presentation about international policy and to briefly visit the Geum estuary. Just before leaving the Republic of Korea, I attended as an observer the US embassy’s NGO offsite. This event, held every year, aims to strengthen ties of international collaboration between the US and the Republic of Korea on environmental matters through the civil society. Last but not least, upon arriving in Beijing I headed to Tianjin to attend the launch of the Tianjin Wetland Volunteer Association with WWF and the Paulson Institute, where I had the chance to know about this great initiative. Now it is finally time to be back in Brisbane, where I will be based at the University of Queensland as part of the Fuller Lab. The technical document from my internship project is expected to be available by August/September, stay tuned. 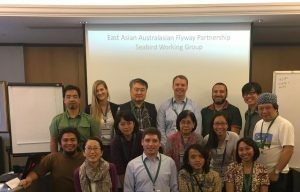 This project has been possible through funding provided by the Australian Government’s Department of the Environment, the University of Queensland, and the East Asian-Australasian Flyway Partnership. Logistical support has been provided by WWF’s regional offices in Australia, China, and Japan. I am very thankful to staff in all those offices. Additionally, I would like to extend a huge thank you to the EAAFP secretariat crew based in Songdo, who were of great support during my time in the Republic of Korea. 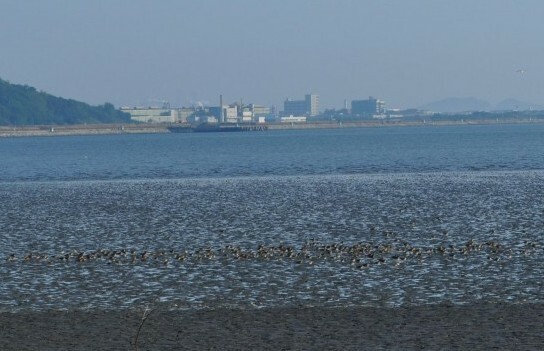 Shorebird flock during northern migration at Songdo (South Korea), where the East Asian-Australasian Flyway Partnership secretariat is based. 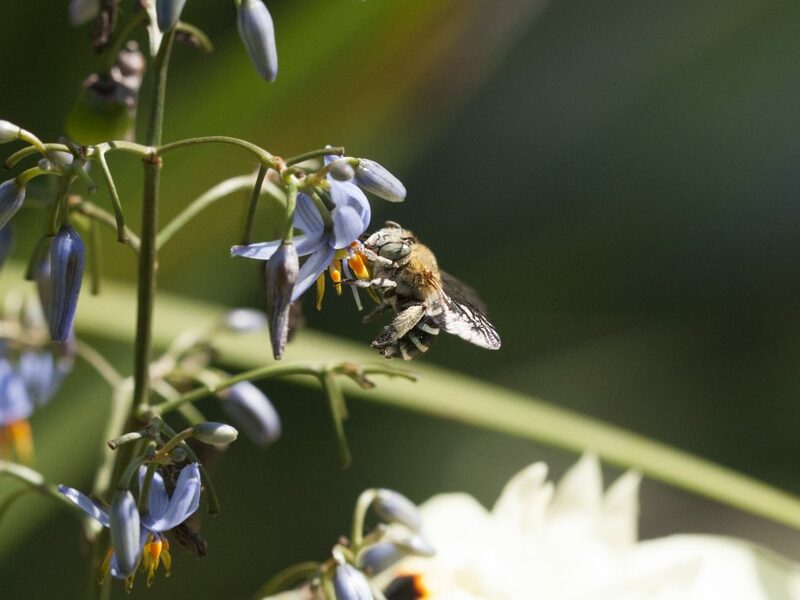 Support of the UQ Biodiversity Conservation Fund is a commitment to arresting the decline of biodiversity and supporting the preservation and recovery of remaining flora and fauna in Australia, which will have significant impact on a global scale. 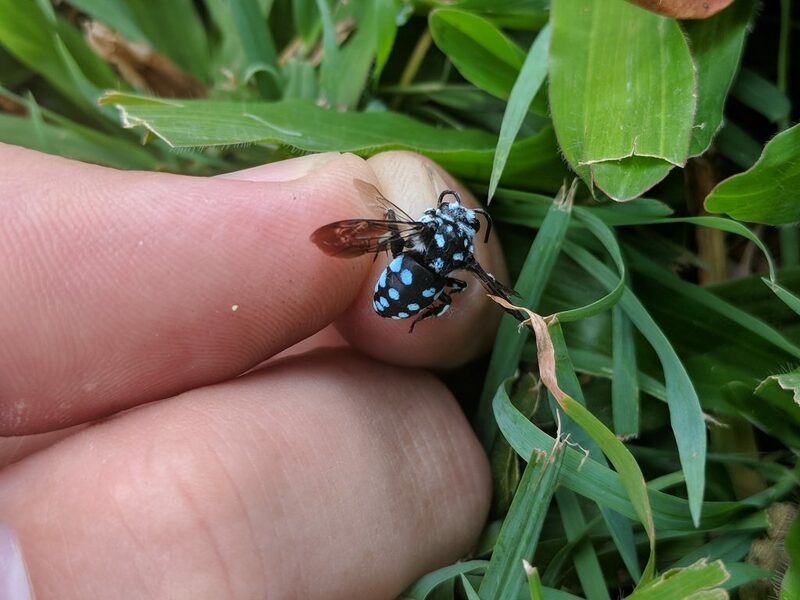 Help support a biodiverse future. 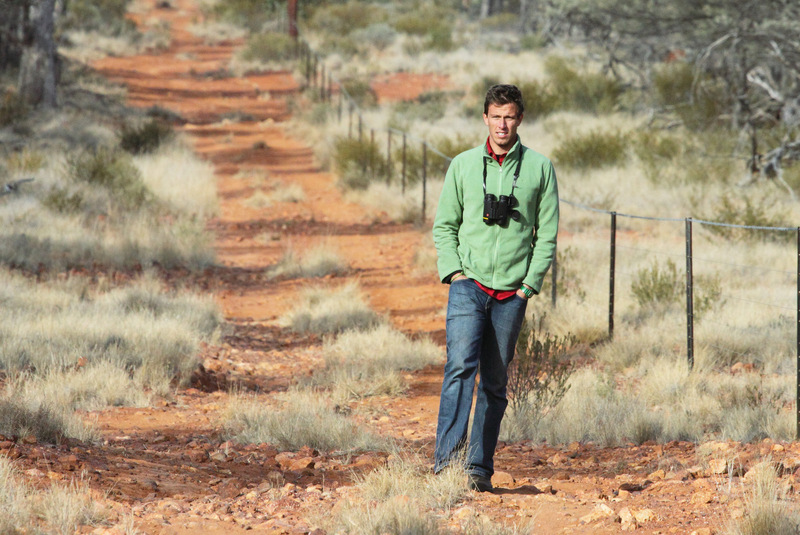 Chris Sanderson reports from the outback bird surveys run by the lab in 2012. This was the second of our annual surveys and we are hoping to keep them running for the long term. In June this year some friends and I took part in a bird survey on the Birdsville Track. Our adventure spanned from Adelaide in South Australia all the way to Birdsville in Queensland, and in the process we saw many of the amazing animals the centre of Australia has to offer. It started, as many adventures do, with an early morning departure. As we headed to the airport before dawn, we discussed all the things the we could possibly see on the trip. Everyone agreed Letterwing Kites would be a highlight, and beyond this we all had a list of things we hoped to see. Having done a major and very successful trip to this area in 2010 I had only two birds in the area that would be new for me: Night Parrot, and Gibberbird. Despite this I was determined to get some good second views of things, and maybe come across some interesting other species along the way. 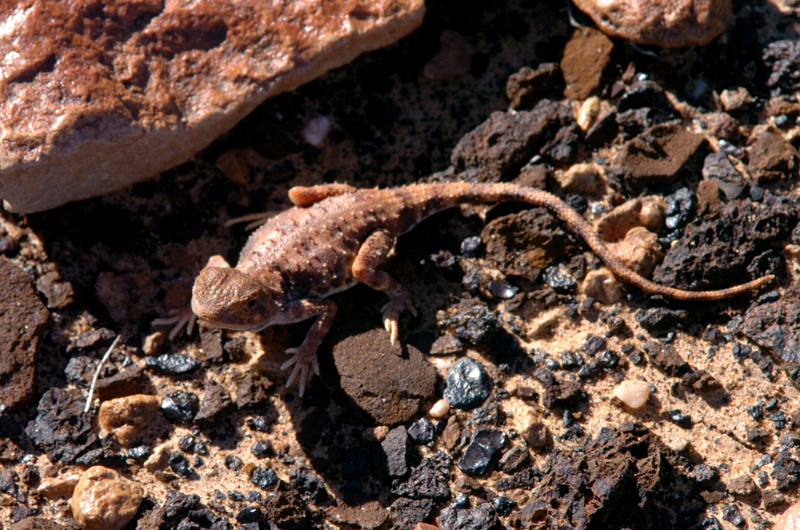 The surveys started in the southern Flinders Ranges, headed north, turned north-east at Marree, and headed all the way along the Birdsville Track to about fifty kilometres past Birdsville. Along the way we stopped every sixteen kilometres and walked about five kilometres of habitat to survey the birds. Have you ever driven through an amazing landscape on your way to somewhere special and said “I wish I had time to do this slowly, just get out and explore the landscape”. Well that’s what we did, and it was amazing. We began and ended our trip in the Flinders Ranges area. Our first survey site was a dried out creek bed surrounded by the rocky, scrubby habitat that is typical of the western side of the Flinders, but looks completely desolate when you first lay eyes on it. Far from it, our first morning of surveys had Elegant Parrots, Australian Ringnecks, Cinnamon Quail-thrush and Redthroat. As we pushed further north we began seeing more raptors, particularly Brown Falcons and Black Kites, and other inland birds became more common, such as the abundant Orange Chats. 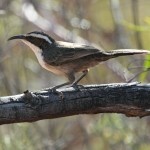 A single White-fronted Chat and a pair of Rufous Fieldwrens were a final prize as we left the Flinders on our way north. 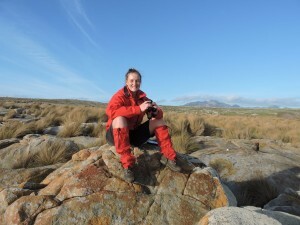 On returning, we had completed our surveys, and allowed for some quality time to be spent checking out the area. Having helped the others on the trip to see many new birds, I was able to set the itinerary for our visit. We had just enough time to do two things I’d wanted to do in the Flinders Range for a long time. The first was to see Yellow-footed Rock-wallabies, and the second was to find the fossil stromatolites for which the park is famous. If you are ever in the northern Flinders Ranges, I can’t recommend the Brachina Gorge Geological Trail enough. The fossil stromatolites were well signed and easy to find. They may not look like much, but they are among the oldest known fossils in the world. These particular ones are about 650 million years old, but some stromatolites date back to 3.45 billion years ago! There are plenty of other things for the geologically-minded traveller to salivate over on the trail, but for those who favour more recent life forms, the Yellow-footed Rock-wallabies are another definite highlight. On entering Brachina Gorge, and knowing that the wallabies should be around, it took us about 5 minutes to find our first group. We thought we had pretty special views of these animals, but a little further down the trail, and we came across another area with a fence and some interpretive signs. The fence said don’t cross so as to not disturb the rock-wallabies. We said “what rock-wallabies” as we scanned the hilltops. Then something moved about five metres away from us. Wow, there were about twenty Yellow-footed Rock-wallabies right by the road, completely oblivious to our presence! The rest of our time at the Flinders Ranges was productive, with lots of other macropods (Common Wallaroo, Western Grey Kangaroo and Red Kangaroo all together), Redthroat, Elegant Parrots and lots of woodland birds. 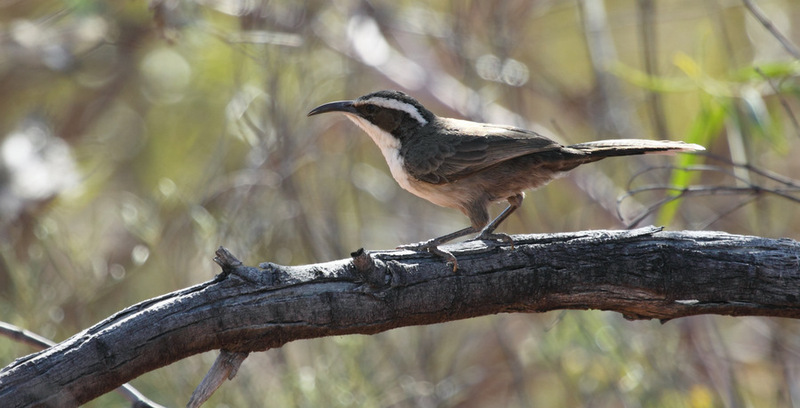 Sadly we missed out on the Short-tailed Grasswren at Stokes’ Hill, a surprise as most people seem to get them fairly easily. The rainy, foggy morning probably didn’t help, but it did allow for some spectacular photography, and some great views of Wedge-tailed Eagles drifting through the mist. After leaving the Flinders Ranges behind (for the first time), we continued our surveys through Lyndhurst, Marree, and onto the Birdsville Track proper. We started encountering stony gibber plains, another seemingly barren habitat that is actually teeming with life. With recent rains, many of the gibber plains were flooded and still held water on claypans all along the track. We came across thousands of Orange Chats, and Cinnamon Quail-thrush were at nearly every site we visited. We found Inland Dotterels at a few sites (mostly flying away at a distance, but we did get some good views), and some small flocks of Flock Bronzewings. My highlight was clearly seeing my first pair of Gibberbirds. They aren’t the most exciting of Australian birds, but they are beautiful in their own right, and the pair we saw first were in crisp breeding plumage, with bright yellow faces and rumps, strutting around the gibber like they owned the place. Near some dams we also found our first Black and Pied Honeyeaters, another sought-after pair of birds from the centre of Australia. We also began to encounter sand dunes, and to keep an eye out for Eyrean Grasswrens. 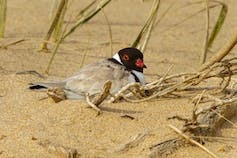 Sadly we weren’t able to get any good views of this shy but locally common species until we were all the way to Birdsville, but we did see lots of great birds and many beautiful wildflowers on the dunes during our surveys. One sad thing about the sandy areas on the surveys was the number of rabbits we saw. My last trip in October 2010 we saw barely any rabbits, and very little sign of rabbit activity in the region. This time we saw hundreds, and evidence of many thousands. It is clear the effects of the calicivirus have ended, and the centre of Australia is in for another plague of rabbits, with a commensurate increase in the number of foxes and cats. One of the most welcome sights after three days without a shower or bathroom on the Birdsville Track is the Mungerannie Roadhouse. We stayed there twice on our trip, and were glad for the accommodation both times. The roadhouse is one of the most iconically “Aussie” pubs you will ever see. There are weatherbeaten akubras attached to the walls and ceilings, photographs of floods and fires on the walls, and cold beer on tap (as long as the truck has made it through this week). There’s even some of the famous vehicles driven by Tom Kruse, the legendary mailman of the Birdsville Track http://en.wikipedia.org/wiki/Tom_Kruse_(mailman) “parked” out in the front yard of the roadhouse. Behind the camping area there is a hot spring which is pumped out into a bore drain. This permanent wetland acts as a refuge all year round for waterbirds in the area. My first visit had many more species, but was in a much drier year (and hotter time of year), however this time we still had a few species of waterbirds we didn’t see elsewhere on the trip. 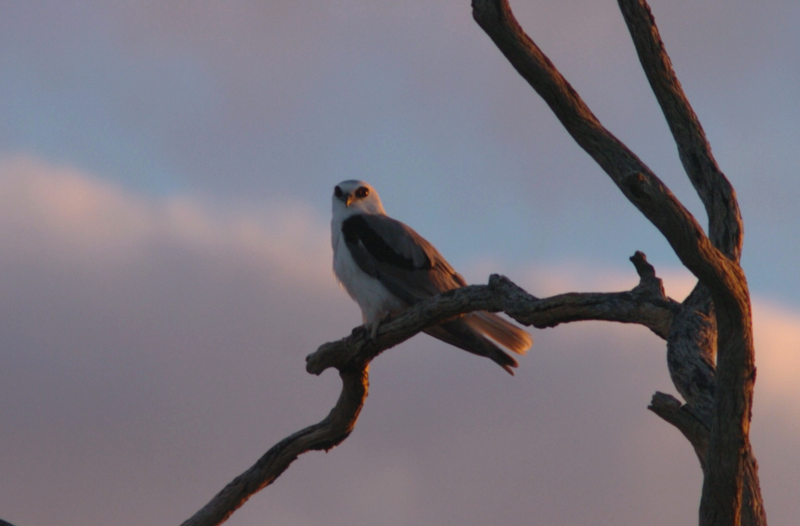 The highlight of the Mungerannie Bore, and indeed the whole trip, was finding a colony of Letterwing Kites. Not at the bore, but nearby on the Birdsville Track, we were lucky enough to come across a huge flock of Black Kites, which we stopped to count. Looking at where they had flown from a dense clump of trees beside water, I thought “that looks like the last place I saw Letterwing Kites”, and sure enough, a quick binocular scan brought up a white bird of prey with a huge black smudge around the eye. In all there were eleven Letterwings that we were able to count, sitting on at least five nests. We stayed near the colony one evening to see what would happen, Letterwing Kites being nocturnal and all. Just before sunset the adults all took to the air and spent the whole of twilight circling around above us. As it finally got too dark to see, we started hearing screeching coming from the nests. What was actually happening was some of the adults had slipped off and caught themselves some prey, and had brought it back to the nests to share with their chicks. We finally tore ourselves away from what was a wondrous experience, and headed back to the roadhouse. On the way we were in for one final treat. A Long-haired Rat bolted across the road in our headlights, and not one but TWO Letterwing Kites came screaming down beside the car trying to catch the poor rodent. We never saw the end of the battle but I presume it didn’t go well for the rat. After over a week camping Birdsville was a welcome interlude. 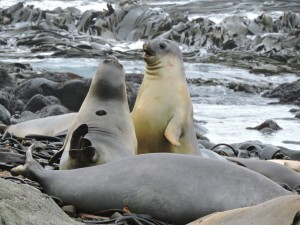 On top of the surveys we had left to conduct we managed a few side-trips that let us see some very interesting things. A drive out to Big Red, the dune at the edge of the Simpson Desert was a fantastic choice. We had a wonderful morning one the huge red sand dune with birds of prey circling overhead and Eyrean Grasswrens (finally!) hopping at our feet. The wetland at the base of the dunes was full, with thousands of waterbirds flying around the area. On the drive back to town we had our largest flock of Flock Bronzewings on the whole trip, maybe a couple of thousand birds that zipped back and forwards across the road and came quite close to where we were standing. To the east of town we were stopped by floodwaters, an odd storm that cut off the Strezlecki survey team at Innaminka for several days. Where the creek had flooded the road we had big flocks of Budgerigars, up to two thousand birds in a single flock and probably as many as ten thousand all up. 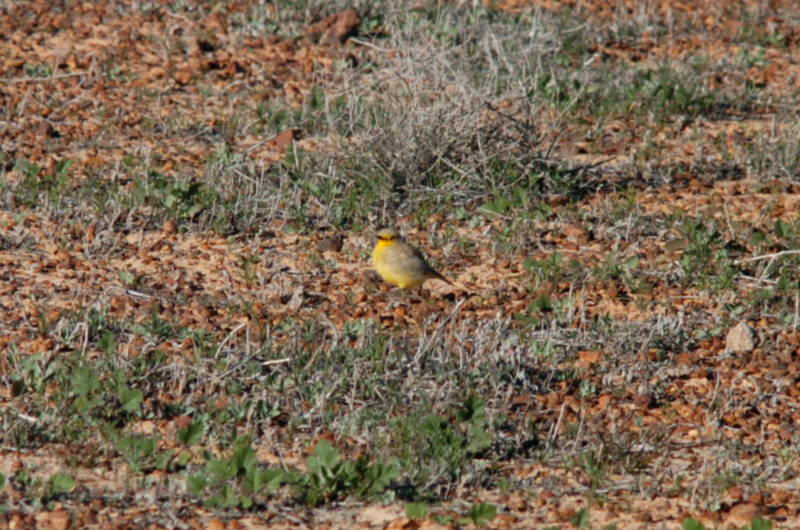 South of Birdsville we got lucky and found Grey Grasswrens beside the track, though they didn’t show well. Still, to find such a challenging bird within five minutes of stepping out of the car felt pretty good! 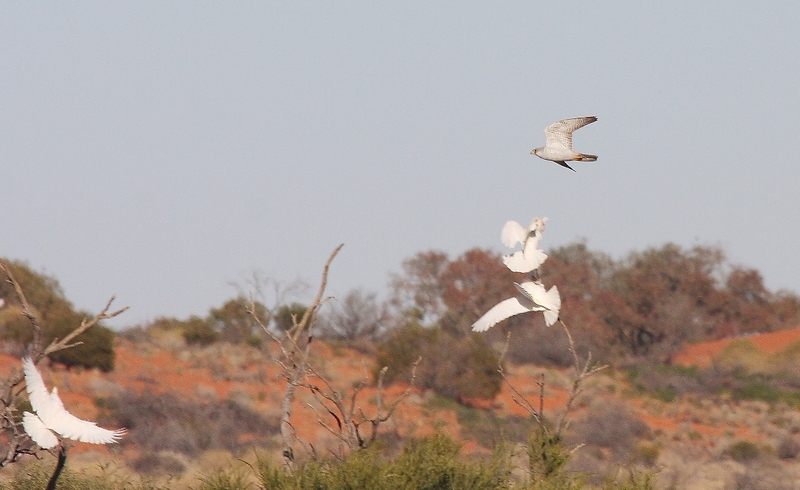 The highlight of Birdsville though, and of the whole trip for me, was our sighting of a pair of Grey Falcons hunting to the east of Birdsville. We had to cancel our surveys for the morning because of a thick blanket of fog over the whole area, an extremely unusual event for Birdsville. We had stopped at a small lignum swamp and decided to try our luck looking for Grasswrens on the way back to town. Sadly we didn’t find any, however as I walked to the edge of a small wetland I flushed about thirty Black-tailed Native-hens. As they scrambled for cover a pair of birds of prey hurtled out of the fog towards me. It took me a couple of seconds to recover from the shock, but I realised pretty quickly that I was watching a pair of Grey Falcons execute a perfectly timed ambush, dropping out of the fog onto the panicked Native-hens. At one stage one of the falcons flew straight towards me, only pulling out of its dive mere metres in front of me. Watching the synchronised chaos of a pair of Grey Falcons zipping around in front of me is one of the highlights of my life, and one I don’t think will be surpassed ever again! So there you have it. Our trip up the Birdsville and back was a highly successful, interesting and thrillling trip. If you get the chance to go there, don’t hesitate. And remember, if you can take the time to get off the beaten track, explore a little bit, you never know what you might find. 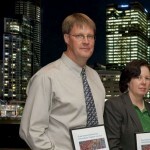 Congratulations to Nick Murray, who recently won a highly prestigious Queensland-Smithsonian Fellowship. Nick will draw on the expertise of research scientists at the Smithsonian’s Migratory Bird Centre to identify the international threats impacting Queensland’s migratory shorebirds. The birds are threatened by a range of human activities in 23 countries during their yearly migration and they are now the most rapidly declining group of Australian birds. “The causes of the declines are largely unknown and several recent analyses suggest that threats overseas may be the principal reason for the declines,” he said. Through collaboration with Dr Peter Marra, a world-leading expert on migration biology, the project aims to develop wide-ranging conservation strategies to reduce declines of Queensland’s 36 species of migratory shorebird. At the presentation evening, UQ Vice-Chancellor Professor Peter Høj thanked the Queensland Government and the Smithsonian Institution for backing the scheme, and congratulated all the UQ fellows. “Opportunities to gain global experience and connect with international peers will lay the groundwork for the success of research projects,” Professor Høj said. The Smithsonian is the world’s largest museum and research complex with 19 museums in Washington DC and New York City, the National Zoo, research centres in the United States, Panama and elsewhere, a network of 20 libraries and various education centres. 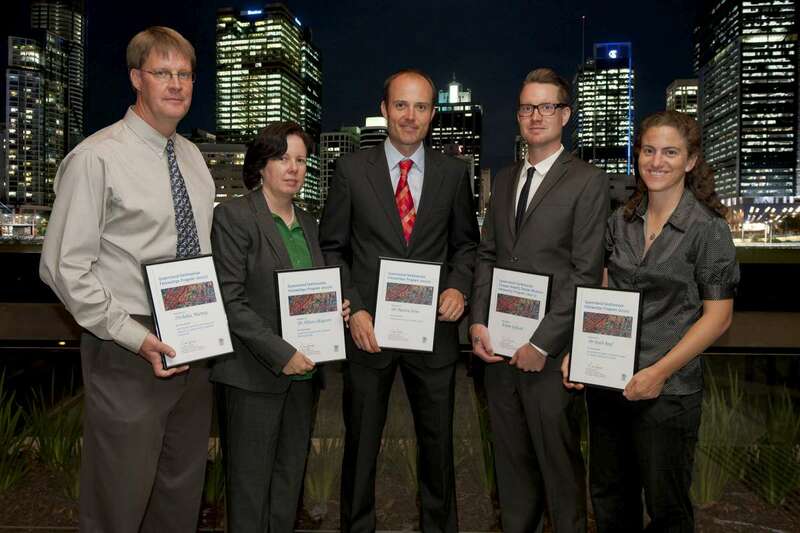 The Fellowships, valued at up to $30,000 each, were announced at the 2012 Science and Innovation reception, part of the bipartisan Science in Parliament program. Fellowship support covers a return economy airfare for the Fellow and contributes towards the cost of living. Rob Clemens, Kiran Dhanjal-Adams and Colin Studds attended the 8th Australasian Shorebird Conference in Adelaide on the 29-30 September. Attendants from across the East Asian- Australasian Flyway, from countries as wide ranging as Indonesia, China, Cambodia, New Zealand and Australia, met to present and discuss “The Role of Science in the Conservation of Shorebirds”. The meeting kicked off with David Paton’s keynote talk on the “Ecological consequences for the Coorong from over-extraction of water in the Murray Darling Basin” and went on to cover a broad range of aspects of shorebird ecology, including that of both resident and migrant species. 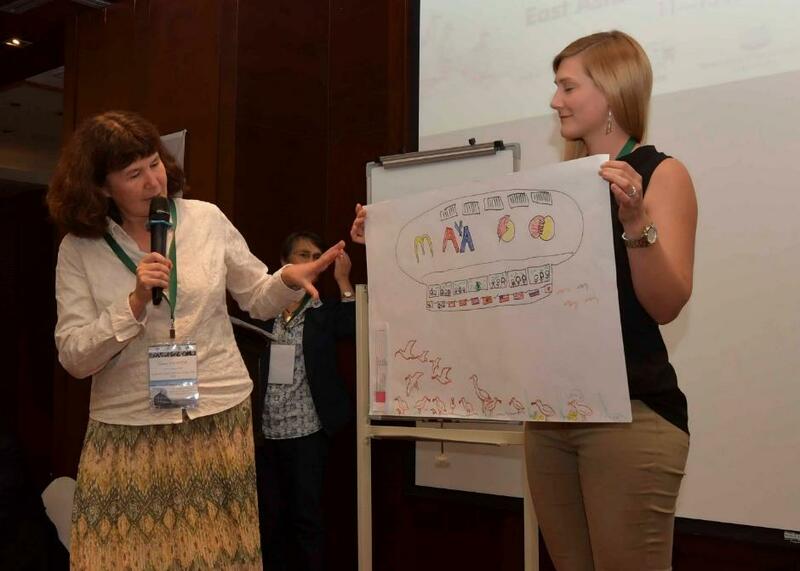 A variety of themes were discussed including migration, the ecology of migratory birds, resident shorebird ecology, Shorebirds in Saltworks, Flyway population monitoring and finally conservation and adaptive management. 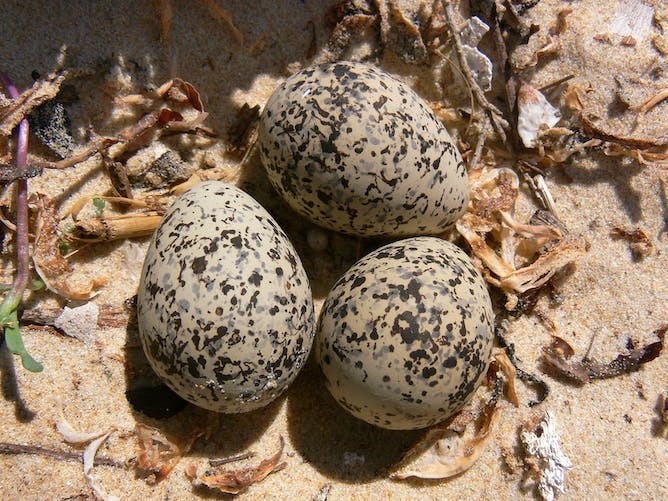 Exciting results are coming from the geolocation work in Western Australia presented by Clive Minton and Ken Gosbell, as the migratory paths of Ruddy Turnstone, Eastern Curlew, Sanderling and Greater Sand Plover are unravelled. The team were also surprised to discover that the incubation behaviour of the birds could be detected when they sat on the nest, shielding the geolocators from the light. Danny Rogers went on to talk about the mystery of the Grey Plovers found in Australia, which are (almost) all female. 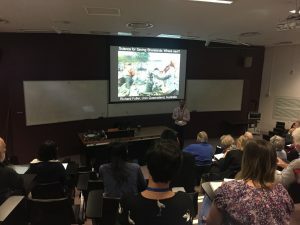 The talks then focussed on the ecology and behaviour of shorebirds in response to factors as varied as departure times, lemming cycles, disease, algal blooms, ecological conditions and industrialisation. After lunch was the turn of resident shorebirds to share the limelight. Reece Pedler and Stuart Collard shared some interesting insights on the boom-bust behaviour of Banded stilts while Grainne Maguire and Meghan Cullen discussed some of the amazing work they has been carrying out to protect beach-nesting Hooded Plovers. 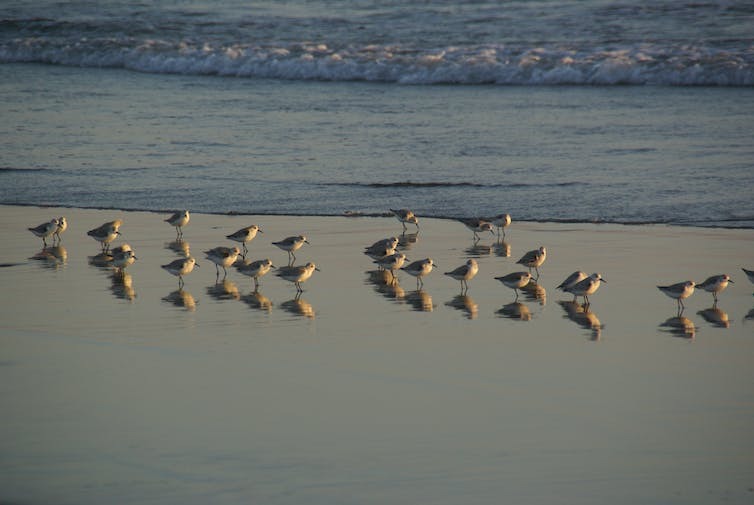 Indeed, their work has not only helped maintain populations but has also shown that people are more likely to respond positively to shorebird protection in crowded areas due to peer pressure. Disturbance is therefore more of an issue in less-used sites as people are less likely to follow protective guidelines where no one is there to take note of or judge them for their misconduct. The second day opened with much discussion on shorebirds in saltworks. The value of these sites as crucial roosting and feeding areas was underlined by many speakers; and is one of the few habitats in Thailand where it is still possible to religiously see the very rare spoonbill sandpiper. Rio Tinto, who own saltworks across the globe, highlighted their commitment to funding research, to protecting shorebirds wherever possible and to bringing this important issue to the attention of the industrial companies with whom they collaborate. The final session focussed on monitoring and adaptive management. Here Rob presented some of the work carried out in the Fuller Lab by Nick Murray and Takuya Iwamura on declines in intertidal habitat and its effects on shorebird migration within the migratory network and has since been invited to talk in Korea next week. Kiran then presented her upcoming work on prioritising disturbance management in Moreton Bay. Other talks included population trends in the Hunter Estuary (Chris Herbert) and how to monitor the ecological character of RAMSAR sites. 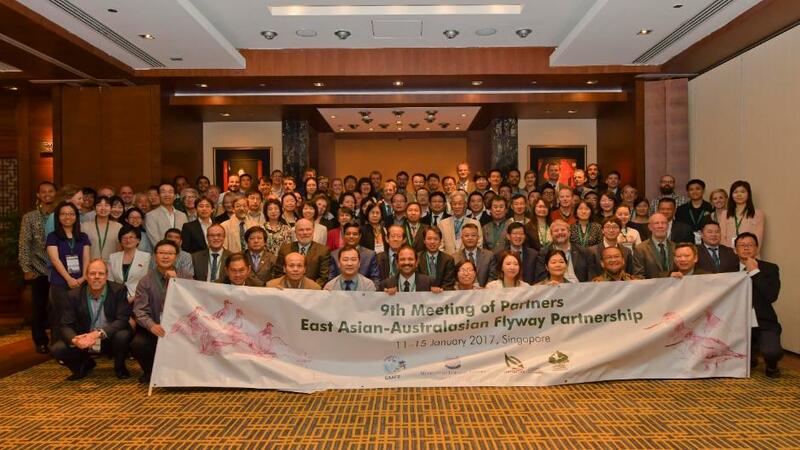 Of this meeting came a renewed sense of how strongly connected all the sites are within the East Asian Australasian flyway; and that to achieve effective conservation outcomes for declining migratory shorebirds, all countries need to act together and decisively. 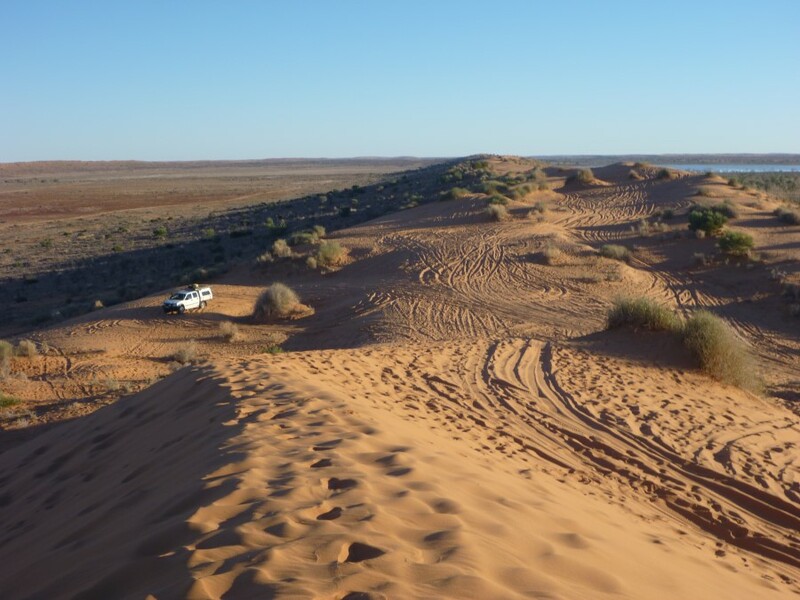 Here’s a trip report from two weeks spent surveying along the Oodnadatta track. It’s long but has a few hidden gems. Now is the perfect time to travel to the region, things are really booming, even more so than last year, and it is green in a brown kind of way. There are lots of wildflowers and a lot of grass. 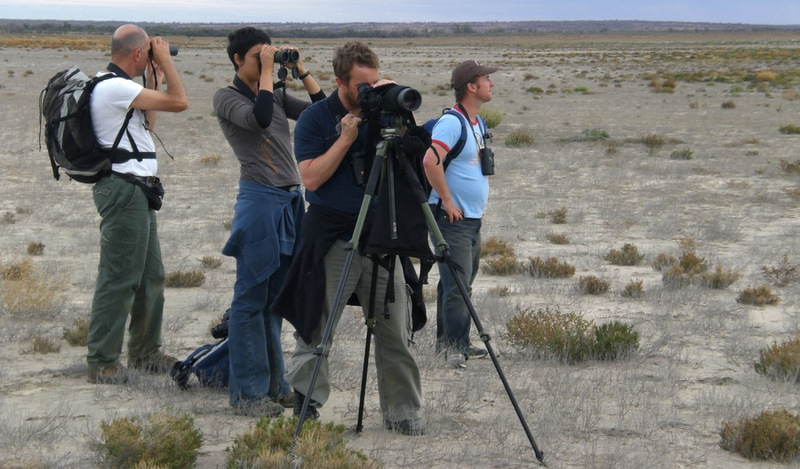 The trip was part of a long-term project run by Stephen Willis at Durham University in the UK, and Richard Fuller at the University of Queensland monitoring the shifting abundance and distribution of Australian desert birds, with mega-transects along the Oodnadatta, Birdsville and Strezlecki tracks, and survey points every 16km. 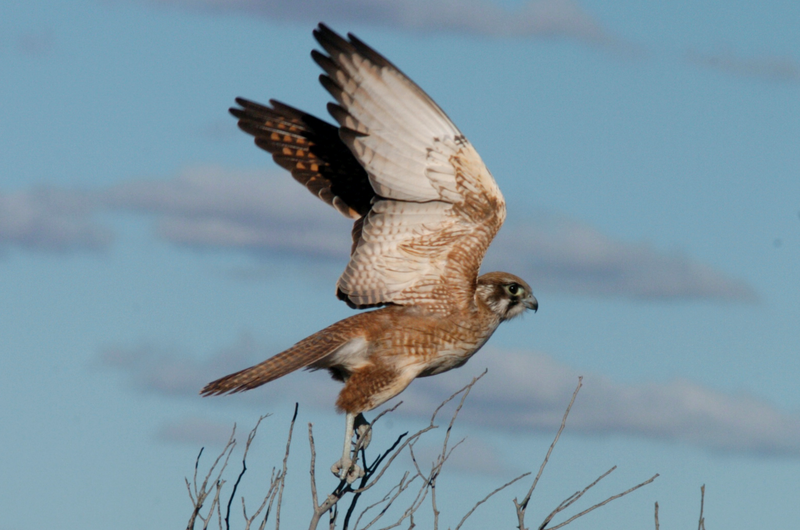 It’s hoped to secure funding for the next decade, and will massively enhance our understanding of the ecology and conservation needs of these outback birds. My two companions were Rob Clemens (formerly of Birds Australia) and Luke Geelen, who has done a lot of fieldwork in the region. The trip started in Adelaide where we did all the logistical things like buying groceries and wondering how to fit all the gear into the hire car. 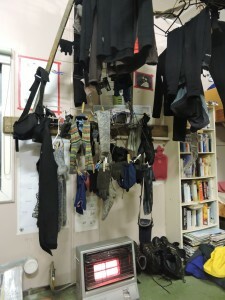 We spent the first night at Rangeview on the Stuart Hwy, under a shelter full of roosting welcome swallows, my first introduction to camping under the stars – I’m never going back to a tent! 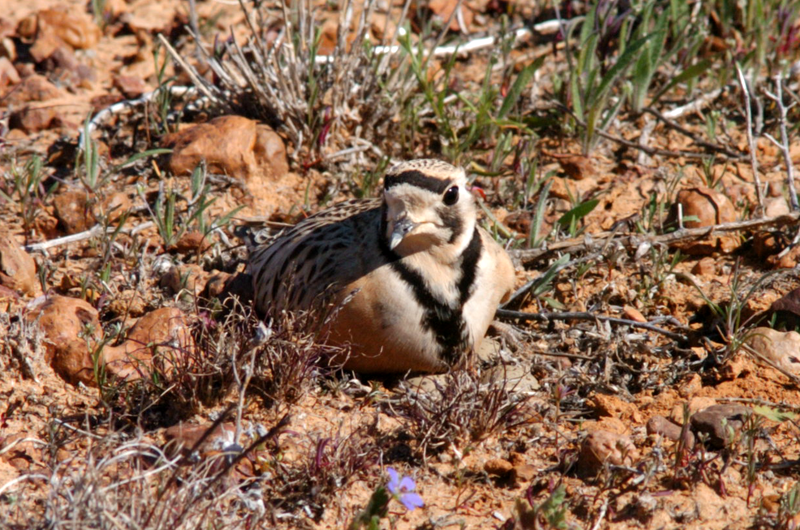 Our desert birding started the next morning on a high with flocks of blue bonnets and mulga parrots feeding in the chenopods nearby and a few friendly pipits wandering around our campsite. We stopped in after lunch at the chestnut-breasted whiteface site south of Coober Pedy (thanks Peter Waanders) where we found the whiteface without too much trouble, along with good looks at cinnamon quail-thrush and the ubiquitous white-winged fairy wren. About 40km out of Marla our survey intersected with a nice bit of mulga woodland which after the gibber plain was (relatively) chock-full of birds. I picked up redthroat, white-browed babbler, singing and spiny-cheeked honeyeaters, red-capped and hooded robin, rufous whistler, mistletoebird and southern whiteface. We surveyed our way down to Oodnadatta and across to Coober Pedy. The aptly named Moon Plain between Oodnadatta and Coober Pedy was allegedly the site of testing for the Mars Rover, and surprisingly is also home to birds. Kestrels could be seen hawking every km or so (we did wonder what they were eating) and gibberbird are not hard to find if you walk enough gibber. These guys were not uncommon north and west of Oodnadatta, though we only lucked onto one on the southern transects. 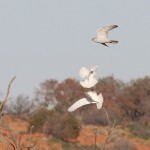 There were also a lot of holes and tracks from the long-haired rat so letter-winged kite may turn up sooner or later. (More on them later). We also spotted a lost pelican and a few orange chats travelling through the gibber plain. After walking 400 transects across the stuff I am now an expert in the many shapes and colours of gibber. There’s the “twist your ankle at every step” gibber, “sink into dust two inches thick” gibber, “just rocky enough to guarantee a rough night’s sleep” gibber and the rarest but much sought after “cobbled lane” gibber. 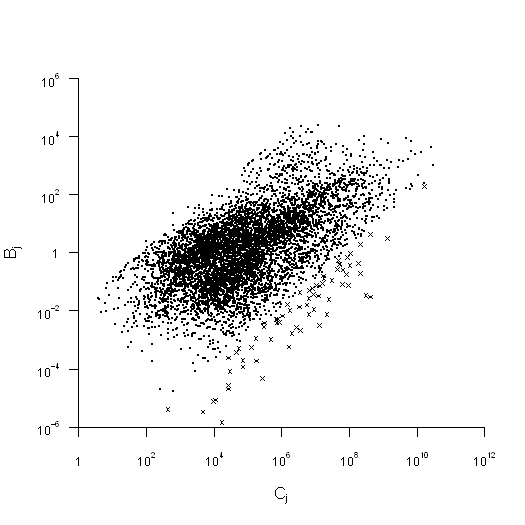 It is truly surprising how interesting gibber can be. The gibber and chenopod shrubland along the track is broken up intermittently with dry creeklines filled with acacia woodland. These are good for birds like hooded and red-capped robin, brown and rufous songlarks, honeyeaters, splendid, white-winged and variegated fairy-wren, whiteface and zebra finch. If you find some eucalypt you can add red-browed pardalote, chiming wedgebill (north and west of Oodnadatta), chirruping wedgebill (south of Ood), pied honeyeater, western gerygone, weebill, slender-billed thornbill, yellow-rumped thornbill, and around water you’ll pick up mulga parrot, ringneck, corella, galah, black kite, white-plumed honeyeater, black-fronted dotterel, crested pigeon, darter, cormorants, grebes, ducks, pelican, grey shrike-thrush, yellow-throated miner, barn owl and red-backed and sacred kingfisher. Hookey’s waterhole, a few km from Oodnadatta on the Coober Pedy road is a beautiful example of a permanent waterhole, and just out of Oodnadatta on the Marla road is some very birdable eucalypt woodland along the creek. Around Coober Pedy there are two spots with water – one is a small pond near the sportsfield. We saw nothing here. On the other side of town is the outflow from the sewage plant, a small stream surrounded by samphire. Follow Hutchinson St north until it turns to a dirt road. No waterbirds, but heard lots of little grassbirds. This would be a good place to keep an eye on as the surrounding landscape dries out. We headed back to Oodnadatta to survey on the road south to Marree. There’s a lot of water around at the moment and south of Oodnadatta are a few water-filled creek crossings. Definitely worth checking out, we got some nice views of red-browed pardalote and chirriping wedgebill and a bunch of waterbirds. Cinnamon quail thrush are common right now and easy to spot in chenopod shrubland, preferring sites with some grass. Listen for their high pitched contact call. They are also present in denser samphire, but impossible to see. 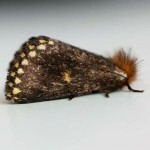 We found them most common from Oodnadatta and further south. Thick-billed grasswren can be found all up and down the track, I found a good place to be opposite “Patsies Car”, an old rusted out blue car on the right-hand side of the road from Coober Pedy to Oodnadatta. We found these grasswrens anywhere the saltbush was taller than 0.75m. The best way to find them is to wander around listening for the faint contact call. If you hear it you know they are within 150m. Don’t go rushing over to where you think they are, they will hide and go silent. The best way is to scan around surrounding bushes waiting for one to perch, if you see one perched you will soon see more hopping around on the ground nearby. Playback and pshing does not work, though very softly imitating their contact call does seem to intrigue them enough for you to approach. Rufous fieldwren like similar habitat, though were more common between William Ck and Marree. 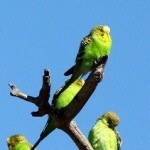 Budgies and zebra finch are both impossible to avoid seeing at the moment. There were two sites along this track that just blew us away with supreme bird awesomeness and I’ll tell you about the one we first came across. Somewhere about halfway between Oodnadatta and William Ck is the start of the dune on the left hand side of the road and a creekline on the right. E28.10928 S135.77128. We came across a huge mixed flock of woodswallows and lots of perching budgies. Black-faced, masked, white-browed and white-breasted. Then I saw it – a pied honeyeater! I had begun to doubt these birds actually existed, having spent plenty of time in suitable habitat but never seen one. There were a lot of other birds here too, including songlarks, honeyeaters, robins and whistlers. We went to bed on a high that night, little knowing that even more excitement was in store for us the next day. Somewhere between 32 and 40km south of William Creek is a gate on the right-hand side of the road heading south, a couple of hundred metres before a big sand-dune perpendicular to the road. E29.06679 S136.52073. Through these gates is a birding mecca, a small waterhole overlooked by the dune. Drawn to it by the massive flock of corella, we had only just got out of the car when a flock of flock bronzewing flew by, and there must have been fifteen pied honeyeater flitting around. As it was getting late in the day and this was our next survey site, we stopped to camp the night in a state of awe. 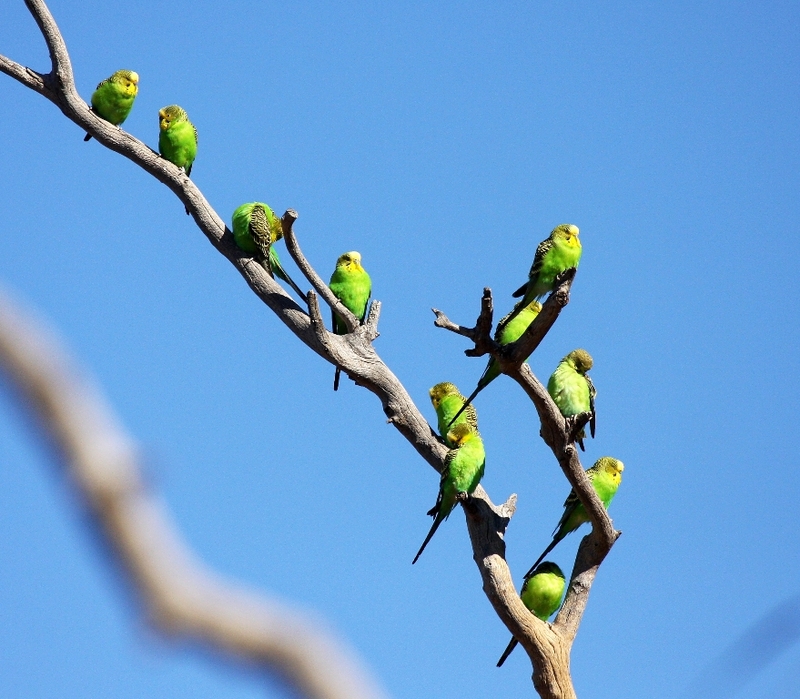 Dawn brought a succession of birds in to drink, starting with Bourke’s parrots. About halfway through the transects I saw it – a crimson chat, our first for the trip. I radioed it through and turned around. “Make that crimson chat and Bourkes parrot”. The reply came a minute later “Rob can top that. He’s got a pair of grey falcon”. There was no way I was finishing that transect so I bolted back to the waterhole where the grey falcon were perched in a face-off with a flock of ravens. We set up the scope and while we were watching when the view of grey falcon was obscured by flock bronzewing. Honestly! On our transects we also came across chirruping wedgebill, diamond dove, budgie, splendid and white-winged fairywren, banded whiteface, brown falcon, nankeen kestrel, wedgetailed eagles, more pied honeyeaters, dotterel, grebe, rufous whistlers, orange chats and robins. If we had been anywhere near a town I would have bought a lotto ticket because on our very next transect 16km south I came across 15 inland dotterel. 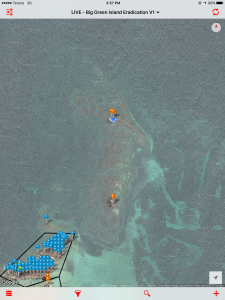 Of course the guys were at the opposite end of the transect and had left their radios in the car. 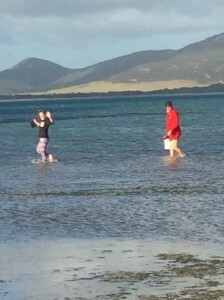 I must really like them because I ran that 800m across gibber to tell them. We lucked onto another group of dotterel a few days later. A night or so later we stayed at Coward Springs where we fell asleep to a horror-movie soundtrack of howling dingoes and shrieking barn-owl. The “hot springs” are better described as “slightly warm springs” but where else can you sit in the bath and watch spotted nightjars hawking? Plus the chance to wash was much appreciated by all three of us (and probably those around us). An early morning bird of the wetland behind the campground turned up spotless crake, black-winged stilt, black-fronted dotterel, rufous fieldwren and loads of little grassbirds in addition to the usual suspects. A little way down the road are some mound springs, now a national park. These are definitely worth a look from a geological and cultural perspective, though not the bird-haven that you might expect from a permanent source of water. We saw red-necked avocet and red-capped plover on an ephemeral lake on the drive in, plus a few dotterel and brown songlark around “The Bubbler”. There are more unsigned mound springs along the Oodnadatta track, keep your eyes peeled. We picked up black-tailed native hen, pink-eared duck, Horsefields bronze-cuckoo, pallid cuckoo and a few other things at Bereford waterhole. Other birds seen along the track include wedgetailed eagle (including a nesting pair with two downy chicks), brown falcon, spotted harrier, black falcon, pipits, black-faced woodswallow, white-backed swallow, little-button quail, stubble quail, Aus raven, little crow and probably a few others I have forgotten. Unfortunately no letter-winged kites and my travelling companions were too sensible to drive the extra 4hrs up the Birdsville track to see the nesting lwks despite my protestations that they were lame and would lose all birding cred if they didn’t. *sigh* we all regretted it when we saw the amazing photos of what we missed. 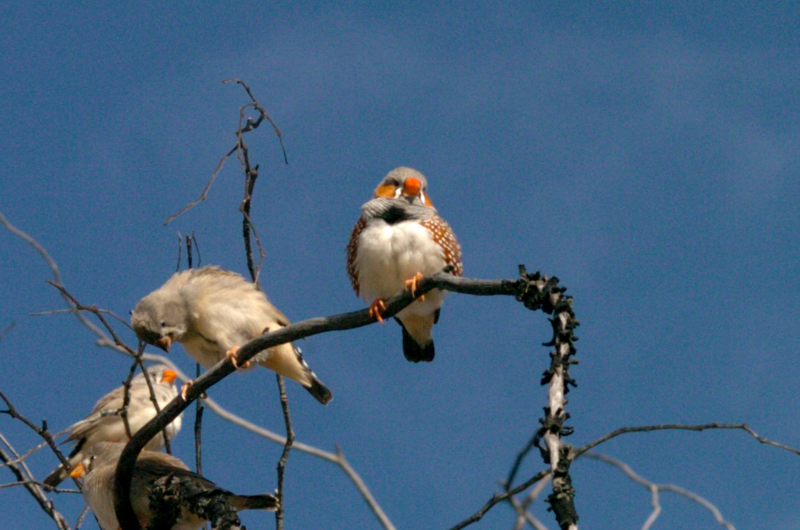 Most numerous bird probably goes to budgie, though it is a close contest between budgie, zebra finch, white-winged fairy wren (look at these closely though, splendids often hang out with them), nankeen kestrel and orange chat. Interestingly, while the robins were quite common on this trip, last year none were seen. Nankeen kestrel which were everywhere this year were also far less common last time. We stopped off at the Flinders Ranges on the way home which at any other time would have been amazing but it doesn’t compare to letter winged kite, and the level of grazing-induced degradation was just depressing. To top things off we dipped out on the short-tailed grasswren despite wandering through spinifex for hours. An unfitting end to an amazing trip! Picked up more redthroat, inland thornbill, elegant parrot and yellow-tufted honeyeaters among others which perked me up a bit. The Leigh Creek retention dam was worth stopping for, full of great crested grebes (we counted 75! ), all types of cormorant and grebe and a few white-fronted chat, plus musk duck. All in all we drove 3000km, walked 160km of gibber, did 350 point counts and 400 transects, spent 14 glorious nights camped under the stars, woke covered in frost 4 times, showered twice, drank 4L of port and a bottle of tequila, and picked up 112 species along the transects with a further 25 along the way. As most of these are nomadic birds I offer no guarantees, but can recommend the Oodnadatta track as a great alternative to the tracks further east. The road is in good condition having been recently graded, there are towns with fuel and water every 200km, incredible scenery and amazing birds. 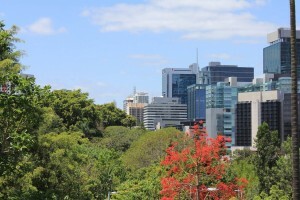 Next year in January the Environmental Decisions Group at the University of Queensland will be hosting the Australian Student Conference on Conservation Science in Brisbane, Australia. This sister conference to the original and successful Cambridge Student Conference on Conservation Science will bring together 100 post-graduate students from the Asia-Pacific region and elsewhere to develop their skills and forge lasting professional relationships. New monograph on Cuckoos of the World published! Our new guide to the cuckoos of the world has just come off the press. The first authors’ copies have arrived, and the title will hit the bookshops in June 2012. Many years in the making, the primary task of this lab was to collate and produce the maps of cuckoo distributions. We assembled a database of more than half a million records of cuckoos, from museum collections, online databases, the literature, birding trip reports, and personal communication from a range of intrepid birders around the world. After a lengthy process of verification and identifying co-ordinates where these did not accompany the original data (driven in the last few months of the work by Cassandra Taylor and Stephanie Kerr), the key task was to determine how to represent the complexity of a species’ geographic distribution in a simple colour map. There are many ways to do this, ranging from complex modelling exercises to simple representations of species’ limits using polygons (see our Fuller et al. 2008 paper on this issue in Journal of Applied Ecology). Given the uncertainty associated with many species’ distributions, we opted for a simple manual representation of species’ distributions for the mapping exercise, and we hope you enjoy the result. You can see the maps with all their original underpinning records here. 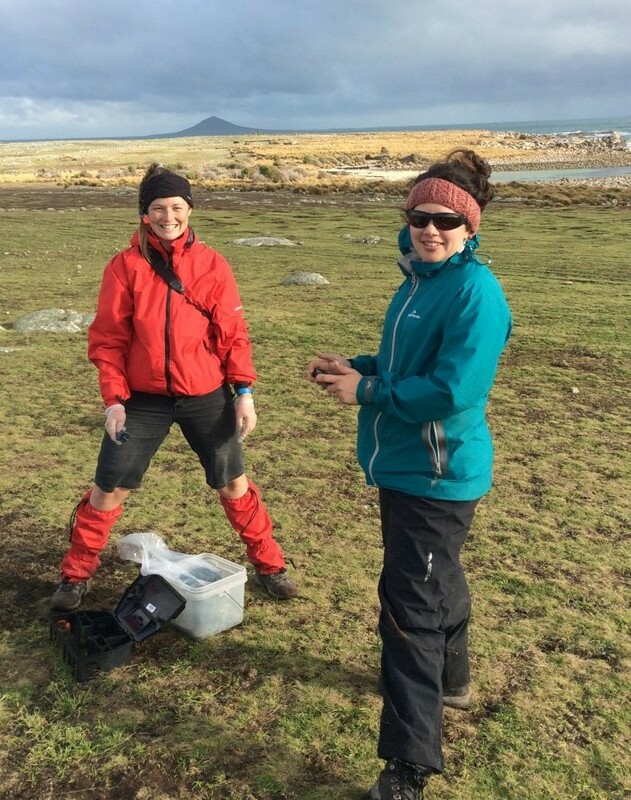 Congratulations to Rocio Ponce-Reyes who has just published part of her PhD work in Nature Climate Change. Her work shows that many of the world’s rarest and richest forests – its high-altitude cloud forests – could be all-but obliterated by 2080 due to the combined impact of man-made climate change and habitat destruction. Writing in the journal Nature Climate Change an international scientific team has warned of the near-total loss of one of the world’s most delicate ecosystems, the Mexican cloud forest, along with 70% of its plant and animal species, as a result of human pressures. She and her colleagues decided to test whether this was so by investigating the specific impact of future global warming on Mexico’s 17,274 square kilometres of cloud forest. They concluded that only about 5557 square kilometres would survive. When they factored in the impact of potential human forest clearing and land use, the surviving area was whittled down to a mere 1 % of its present extent – just 151 square kilometres. “At present only about 12 % of Mexico’s cloud forest is protected – and it is not clear how effective that protection will be by the latter part of this century,” Ms Ponce-Reyes says. “Immediate action is required to minimize this loss—expansion of the protected-area estate in areas of low climate vulnerability is an urgent priority,” the international scientific team declared. They identify as a particular priority for rescue the cloud forest at the Sierra de Juárez in Oaxaca. This supports 22 of Mexico’s most endangered species and is expected to retain relatively large fragments of cloud forest despite rapid climate change, if only it can be protected. While Australia has no cloud forest, the same fate could befall its highly diverse temperate rainforests in North Queensland, says CEED director Professor Hugh Possingham. “On tops of mountains, the Wet Tropics rainforests are cool and temperate unlike the tropical forests below them. Like Mexico’s cloud forests, they harbour a highly specialised flora and fauna that occurs nowhere else in the world. “Fortunately, the clearing of such forests has all but stopped leaving climate change as the only, but still significant, threat,” he says. The world is currently losing about 1.1 % of its total estate of cloud forest every year due to timber felling and land clearing alone: global warming is likely to redouble the rate of loss. As there are no new cool, high, moist areas to which species can readily migrate, the scientists caution that loss of most of the world’s cloud forests is all but unavoidable in the absence of radical efforts by humanity to remove carbon from the atmosphere. However, at present global carbon emissions are continuing to rise at the highest rate allowed for in the global climate scenario of the International Panel on Climate Change (IPCC), pointing to overall warming of +5° to +6° Celsius by 2100. “If bold measures are not taken very soon to reduce the concentration of greenhouse gases, these forests are unlikely to survive in their present form, with anything near their present diversity, very far into the twenty-first century,” the scientists warn. Their article “Vulnerability of cloud forest reserves in Mexico to climate change” by Rocío Ponce-Reyes, Víctor-Hugo Reynoso-Rosales, James E. M. Watson, Jeremy Van Der Wal, Richard A. Fuller, Robert L. Pressey and Hugh P. Possingham appears in the latest issue of the journal Nature Climate change. 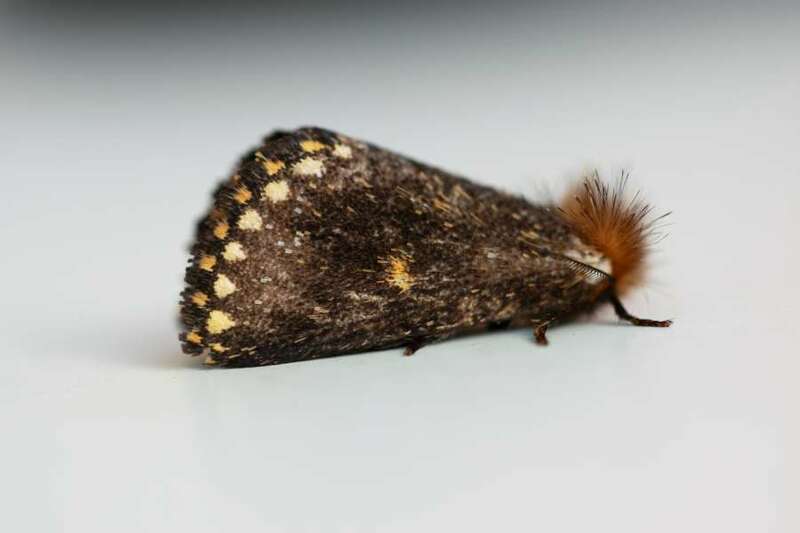 The lab has recently been awarded a grant from the National Climate Change Adaptation Research Facility to investigate how we can help Australia’s threatened species adapt to climate change. Several decades of research has shown that many species are likely to go extinct because of climate change, but which species these will be, and what we can do to prevent these extinction remain uncertain. We believe that it is crucial to use high quality science to help us make choices about which species we should protect, and whether we should be protecting or restoring habitat for some species that will be affected by climate change. In this project, we will build predictions about how species and habitats will move in response to climate change over the next century. Crucially, we will then work out how much it will cost to protect existing habitat for these species, and to restore new habitat where this would help the species survive. We will take into account uncertainty about the costs, benefits and feasibility of these conservation activities, to provide clear advice where, when and how to act to help our nation’s biodiversity adapt to climate change. 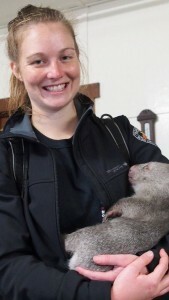 The postdoctoral researcher working on this project is Dr Ramona Maggini, and UQ honours student Jasmine Lee has been awarded a scholarship through WWF-Australia to work on predicting climate vulnerability for Australia’s threatened species. 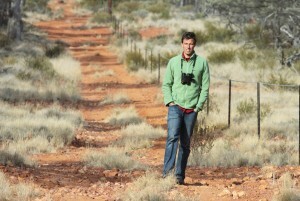 1st February 2011: Story in Australian Geographic based on our recent paper on protected areas. ABC Online: Are our national parks barking up the wrong tree? Fuller, R.A., McDonald-Madden, E., Wilson, K.A., Carwardine, J., Grantham, H.S., Watson, J.E.M., Klein, C.J., Green, D.C. & Possingham, H.P. 2010. Replacing underperforming protected areas achieves better conservation outcomes. Nature, 466, 365-367. Taylor, M.F.J., Sattler, P.S., Evans, M., Fuller, R.A., Watson, J.E.M. 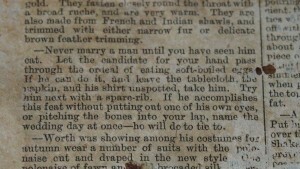 & Possingham, H.P. in press. What works for threatened species recovery? An empirical evaluation for Australia. 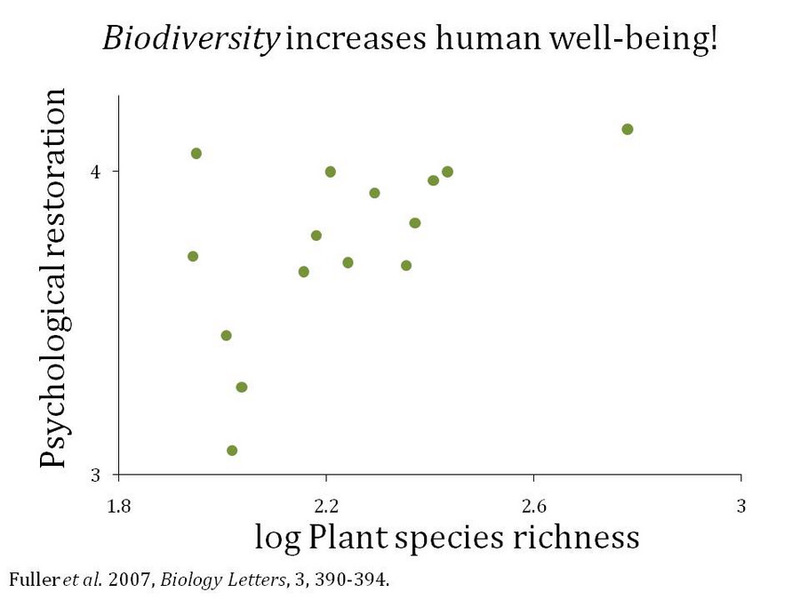 Biodiversity and Conservation. Watson, J.E.M., Evans, M.C., Carwardine, J., Fuller, R.A., Joseph, L.N., Segan, D.B., Taylor, M.F.J., Fensham, R.J. & Possingham, H.P. in press. The capacity of Australia’s protected-area system to represent threatened species. Conservation Biology. 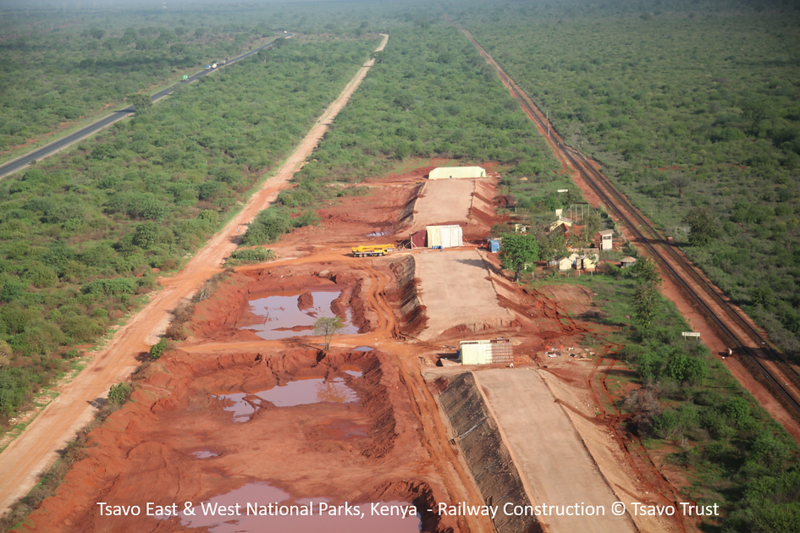 Read more about our work on conservation planning. Boakes, E.H., McGowan, P.J.K., Fuller, R.A., Chang-qing, D., Clark, N.E., O’Connor, K. & Mace, G.M. 2010. Distorted views of biodiversity: spatial and temporal bias in species occurrence data. PLoS Biology, 8, e1000385. Historical as well as current data on species distributions are needed to track changes in biodiversity. Species distribution data are found in a variety of sources but it is likely that they include different biases towards certain time periods or places. By collating a large historical database of ~170,000 records of species in the avian order Galliformes, dating back over two centuries and covering Europe and Asia, we investigate patterns of spatial and temporal bias in five sources of species distribution data: museum collections, scientific literature, ringing records, ornithological atlases, and website reports from “citizen scientists.” Museum data were found to provide the most comprehensive historical coverage of species’ ranges but often proved extremely time-intensive to collect. Literature records have increased in their number and coverage through time, whereas ringing, atlas, and website data are almost exclusively restricted to the last few decades. Geographically, our data were biased towards Western Europe and Southeast Asia. Museums were the only data source to provide reasonably even spatial coverage across the entire study region. In the last three decades, literature data have become increasingly focussed towards threatened species and protected areas, and currently no source is providing reliable baseline information—a role once filled by museum collections. As well as securing historical data for the future and making it available for users, the sampling biases will need to be understood and addressed if we are to obtain a true picture of biodiversity change. Delivering Better Biodiversity Protection For Free! We recently published a paper in Nature showing how it is possible to dramatically improve the performance of protected area systems by replacing a small number of poorly performing sites with more cost-effective ones. This benefit to conservation is delivered without spending a single extra dollar. Protected areas are one of the most important tools in modern nature conservation, with over 100,000 sites covering about 12 per cent of the land and territorial waters of countries worldwide. Enormous efficiency gains could be achieved by modest and careful adjustments to a protected area system. A more flexible approach to the expansion of a protected area system could ultimately protect much more biodiversity. The contribution of Australian protected areas to conserving vegetation types relative to their rarity (B) is positively related to the estimated cost of acquisition and management of the sites (C). However, there is a great deal of scatter in cost-effectiveness among the 6,990 protected areas; here the least cost-effective 1% of sites (70 protected areas) are denoted by crosses. Our modelling has shown that replacing the least cost-effective 1 per cent of Australia’s 6990 strictly protected areas could triple the number of vegetation types that are adequately protected. This huge benefit occurs because of the enormous variation in cost-effectiveness among existing sites. The figure on the left shows that some sites are delivering very little biodiversity protection given the level of investment needed to purchase the land. The paper has sparked controversy because many conservationists view protected areas as sacred sites that shoud be protected in perpetuity. However, the reality is that many protected areas are in the wrong places, regions not needed for agricultural or urban expansion. Some of our reserves simply aren’t making the best use of this expensive form of conservation to protect our key natural values. We can do much better if we reverse the protection status of the least cost-effective sites and use the resulting capital to establish and manage new protected areas. The rate of investment in new protected areas has slowed globally in recent years. Ensuring that the best places are protected is now more important than ever.